Pronto post (quick, necessary & impulsive) is in order on this horrid rainy week … Hope all you Sydneysiders are staying dry! 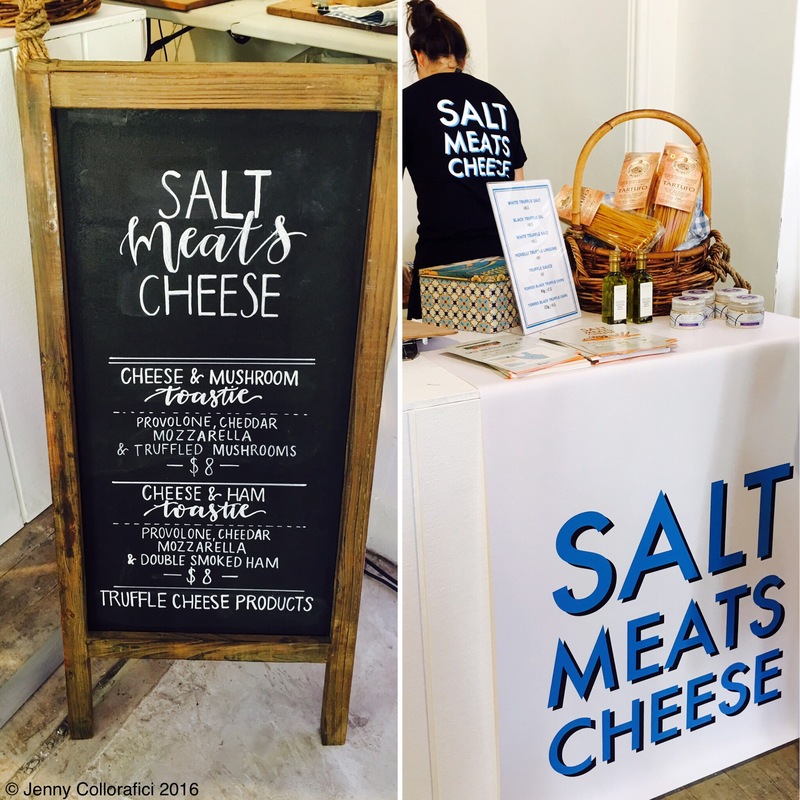 … One of the things that I love about Sydney are the little random food events that pop-up! 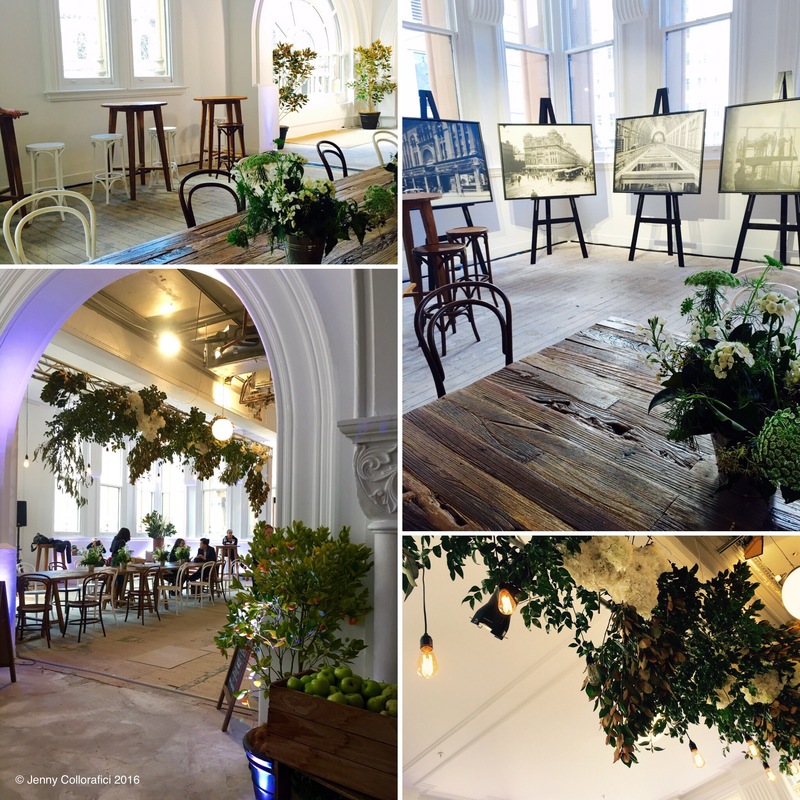 Thank god for my regular Broadsheet emails & social media as a whole … I recently found out that there is a “Marketplace” pop up in QVB building to warm up Sydneysiders – in their heart & bellies. Located on Level 1 in the QVB there is an open space hosting for a short period til Sunday 7th August. One of my food passions is PIZZA … Who doesn’t love pizza?! Just to make it clear, I am not taking about Dominoes or Pizza Hut or Crust … This is real Italian pizza with the scent of woodfire-oven-cooking with melted mozzarella cheese. 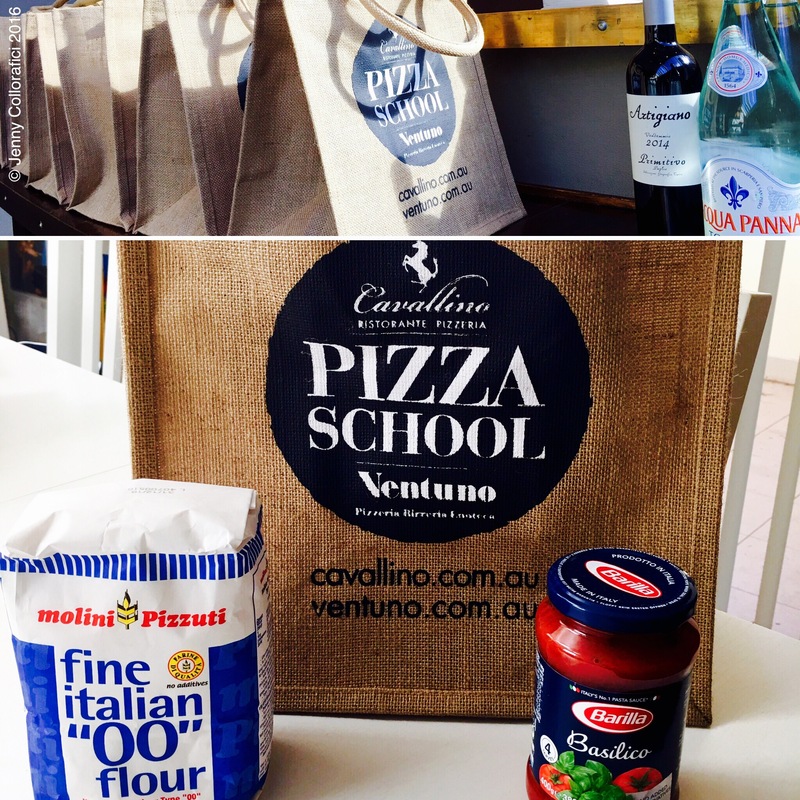 Recently I received quite possibly one of the best gifts – a pizza cooking class at Cavallino in Terrey Hills. 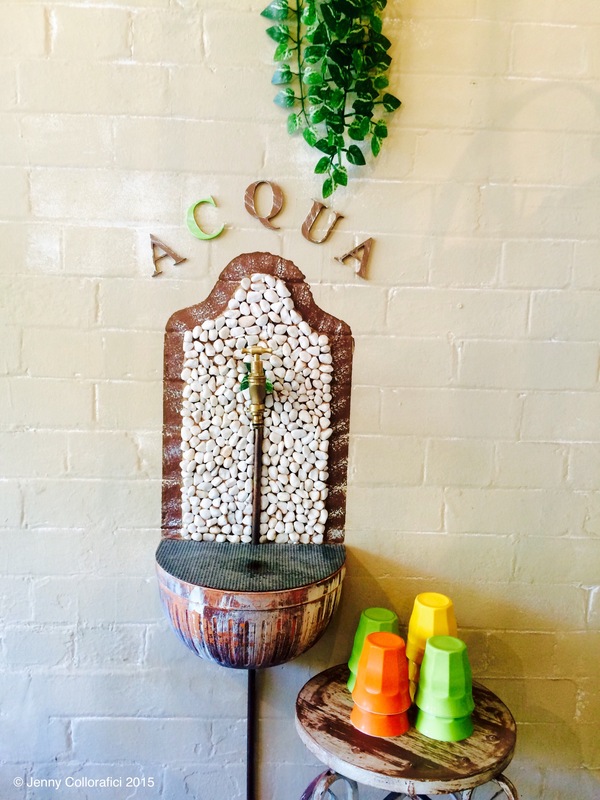 Cavallino is a traditional Italian restaurant run by the same owners of Ventuno in Walsh Bay. 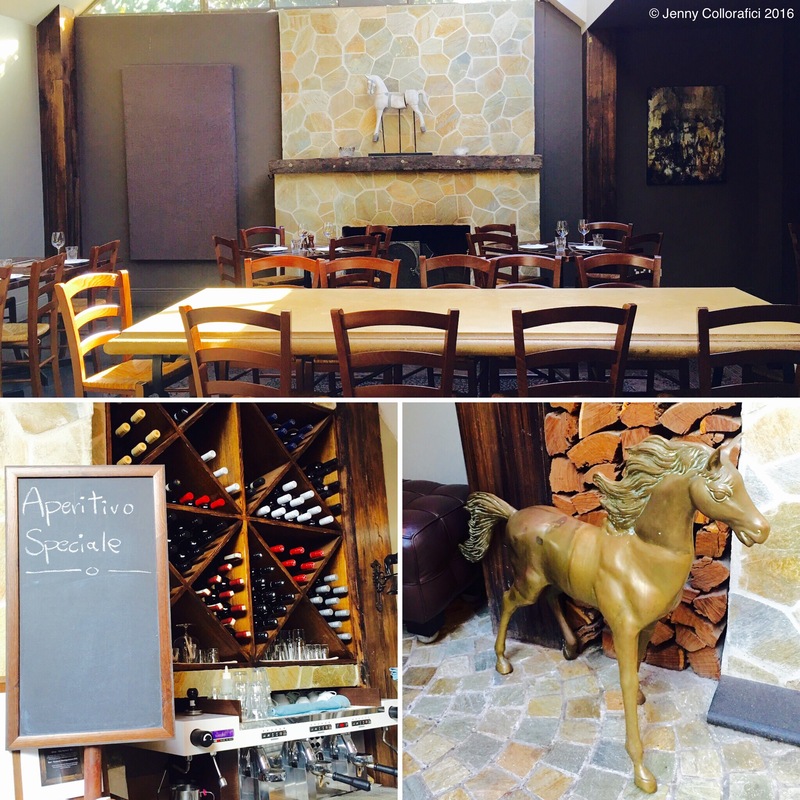 The rustic decor is adorned by “cavalli” (horse) references from little horse hooks, paintings, horse statues, lamps, saddles … The warmth of the place is very inviting & dabbles in the modern theme as well. 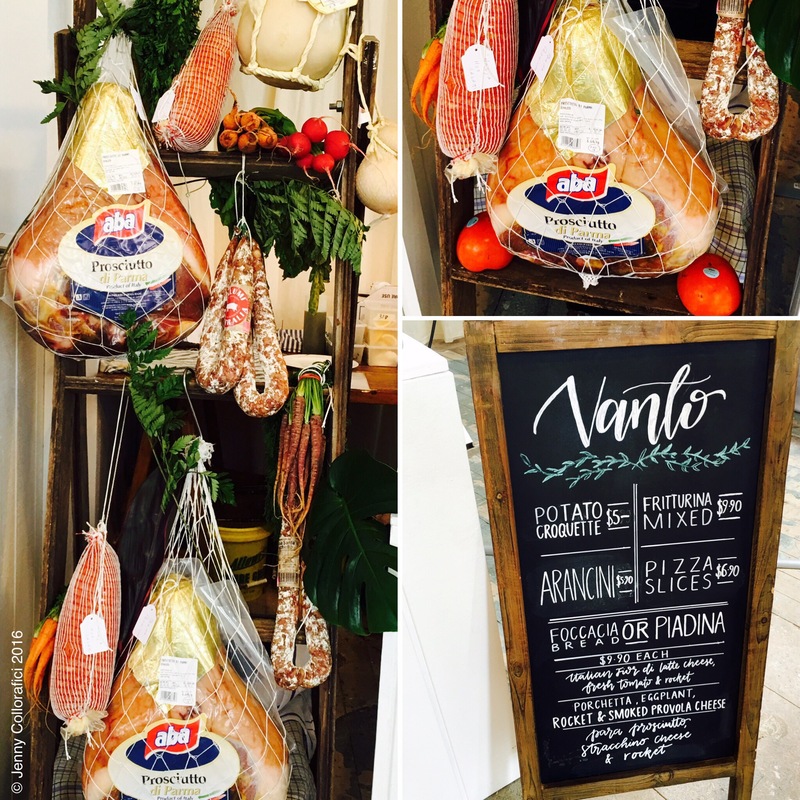 There is also a mouth-watering fridge filled with cured meats and salami, cheese & a trolley selection of Italian alcoholic spirits. Both owners (Lido & Roberto) are present at the Pizza Making class – and it’s led by chef Roberto for the step-by-step demonstration. As the class commences, we are taken on a journey explaining how pizza can vary from various regions and how the margarita pizza was inspired using the Italian flag colours of red (tomato), white (mozzarella) & green (basil). Seated in a small semi circle facing the adorned woodfire oven, the small class is intimate enough to feel like you are personally hanging out with good friends. We are given a folder with all sorts of goodie recipes when it comes to making pizza dough, sauces, suggested toppings and oven tips. As pizza dough does need to be made in advance (for the yeast to go through the proofing process) Roberto had some ready-to-go to create a nice light & fluffy pizza base with a perfect pillow crust. One amazing day I came home to a “surprise” – as a slowly entered the apartment, the scent of dark chocolate enveloped my taste buds. 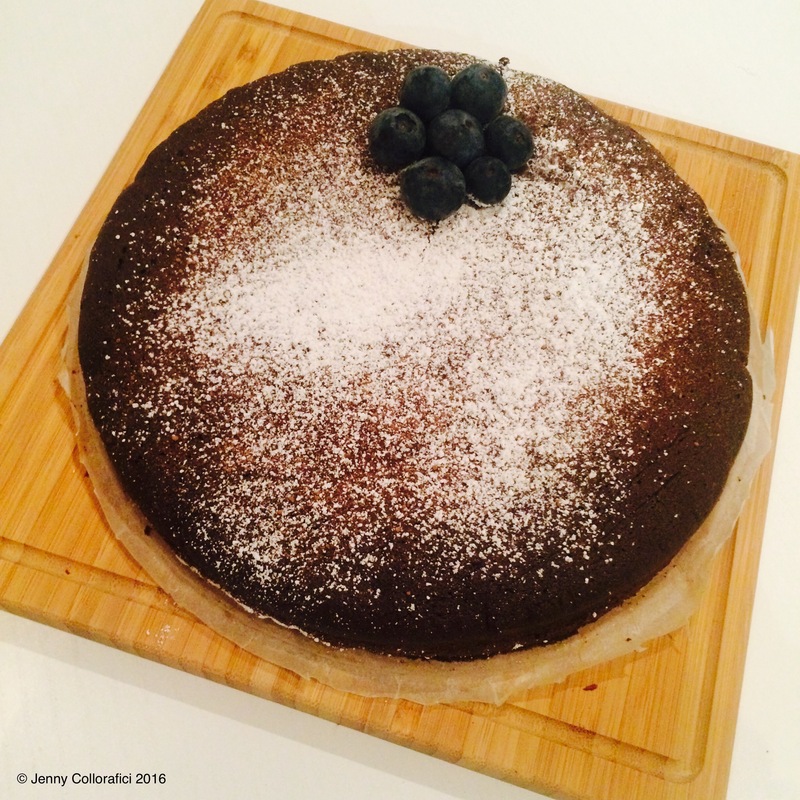 My boyfriend had baked me a cake … Best surprise ever and that had made my day! This cake – has a tantalising layer of delicate broken cake crust on the top (like a brownie) and moist, soft and buttery dark gooey chocolate goodness on the inside – chocolate elegance. 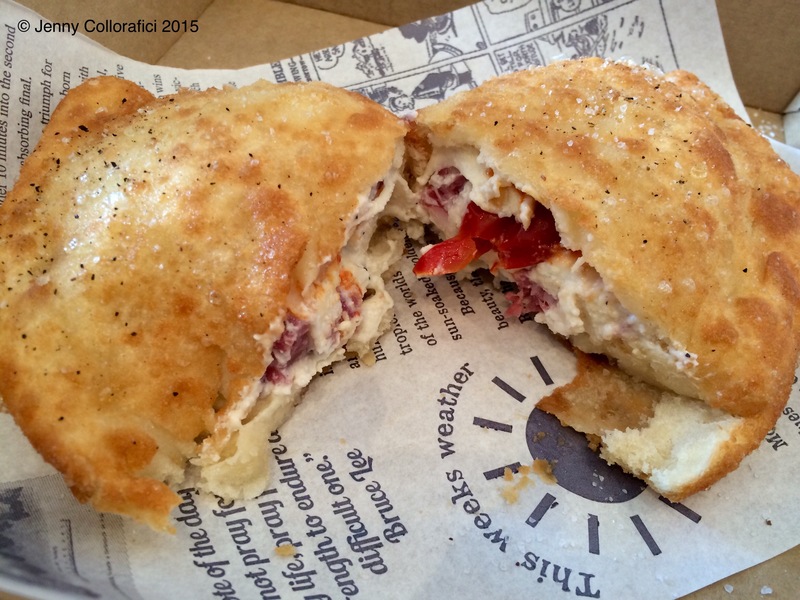 Originating from Italy, the Torta Tenerina famously comes from the city of Ferrara in Emilia Romagna. Upon my first visit to this city, the ongoing dessert theme was this cake! … Served alone hot or cold, served with panna (cream) or even strawberries. Some takes on this cake were thinner and some were taller. The recipe remains the same but there can always be a slight tweak. The history and original name of the Torta Tenerina was once called “Montenegrina” or “Queen of Montenegro cake” back in early the 20th century. This aristocrat food pampering refers to a lady whom this cake was once inspired by & named in honour. 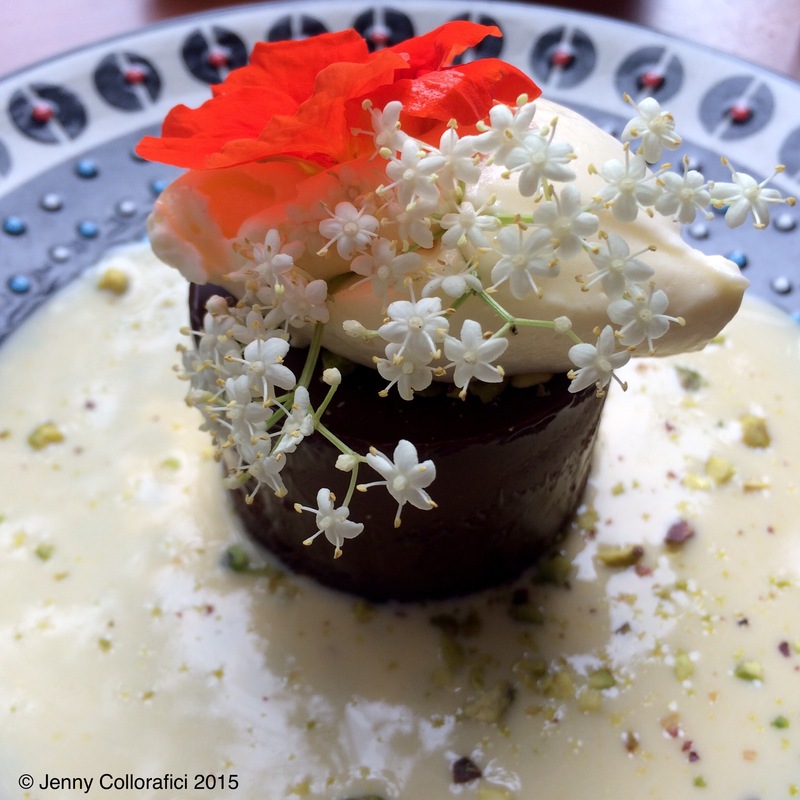 This sweet decadent dessert was named after the Queen of Montenegro: Elena Petrovich. Elena met Vittorio Emanuele III at the theatre “La Fenice” in Venice and it was love at first sight and soon after they were married on the 24th October 1896. Elena was known to be a spouse/wife with a “cuore tenero” (literally soft heart). Torta Tenerina was inspired by Elena – sweet with the soft centre. 1) Separate 3 eggs in 2 different bowls – egg whites & egg yolks. 2) In one bowl with the egg yolks add half the sugar and beat until it’s a pale yellow colour. 3) Add the remaining sugar to the egg whites and beat for a while until it forms fluffy meringue peaks. 4) Over a pot of simmering water, add a heatproof bowl or smaller pot – slowly melt the chocolate stirring gently. 5) Add cubes of the unsalted butter to the mix & stir in each piece to melt in. Once all pieces have been melted, allow to cool down for about 10-15 mins. In the interim you can preheat the oven to 180 degrees. 6) Add the cooled chocolate mix to the egg yolk mix and stir until combined. 7) Add the milk (I used almond milk) & flour and keep gently mixing. 8) Lastly gently fold in the egg white meringue peaks. 9) Pour into a baking tin that has been lined with baking paper & greased. 10) Cook for about 20 mins until a cracked crust has formed at the top surface. I find that it’s best to slightly undercook as it does set once it cools. This cake is so simple and delightfully decadent that usually only a light dusting of icing sugar is needed to finish off the look & taste – maybe some cream & berries if you want to inject fruit freshness. Anyway readers – thanks for tuning in once again and I hope this post inspires you to do some much necessary baking! 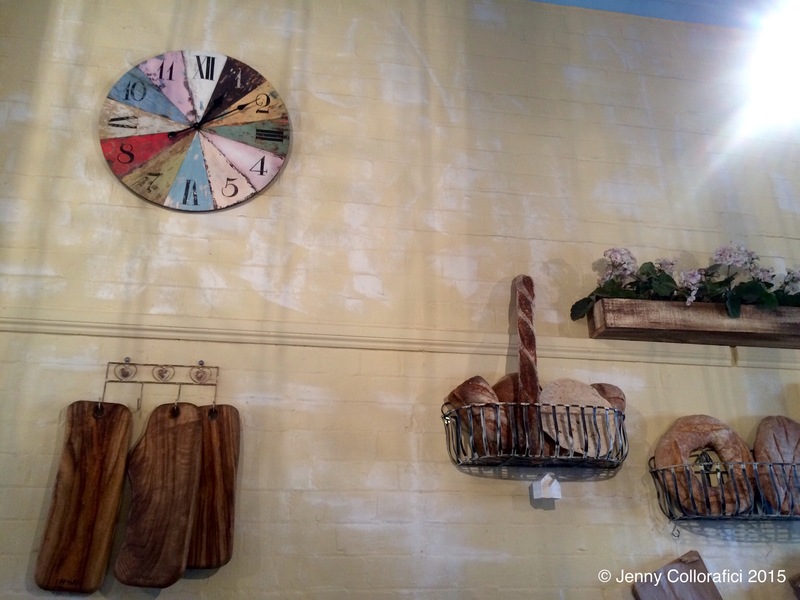 … Coming up soon will be my Pizza Making Class – an incredibly tasty & salivating experience. Enjoy the week and keep your eyes ready to the next visual eye-pleasing post. 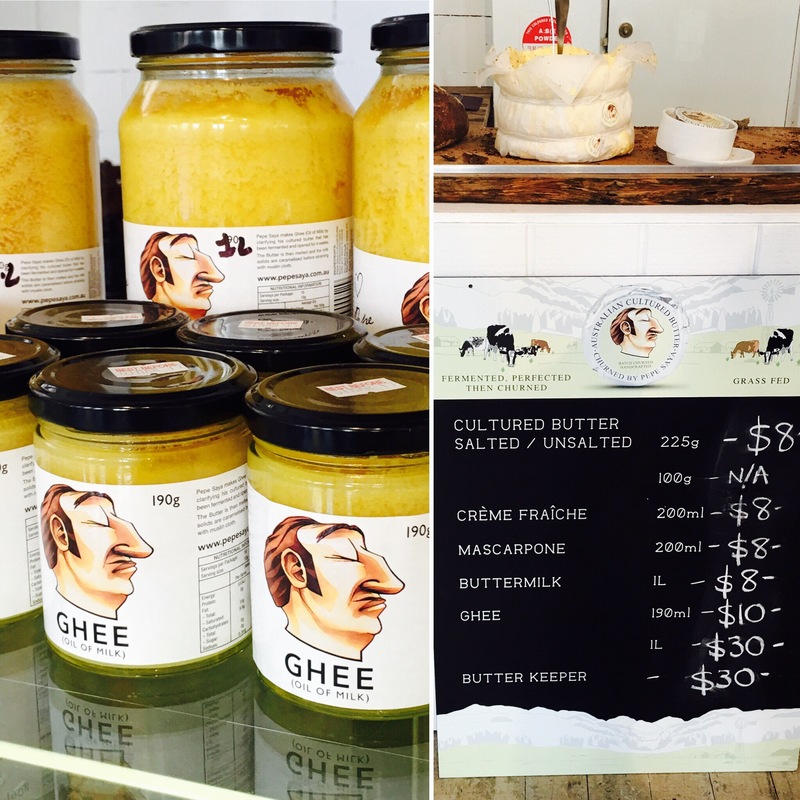 There are very many countries where the cuisine is traditional & so amazing that there would be no need to sample other cuisines of the world … But this is Sydney – city of multiculturalism. You know when you go to a place and they have a dish that is a MUST order and what you are addicted to?! Well this is Hem Nine Nine’s Crispy Netted Spring Rolls. 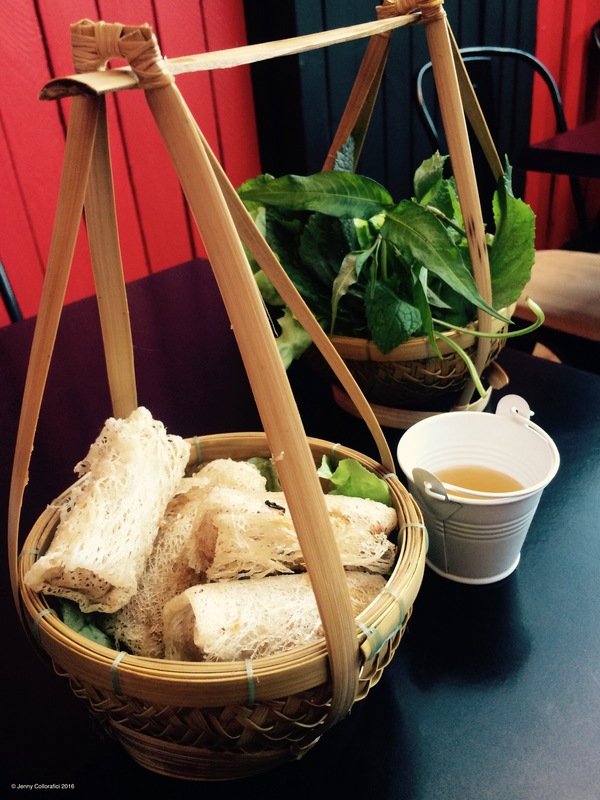 Either filled with vegetable or seafood (I’ve had both) – the dish arrives presented in a cute basket set, one filled with a generous amount of spring rolls and the other with mint & lettuce leaves. 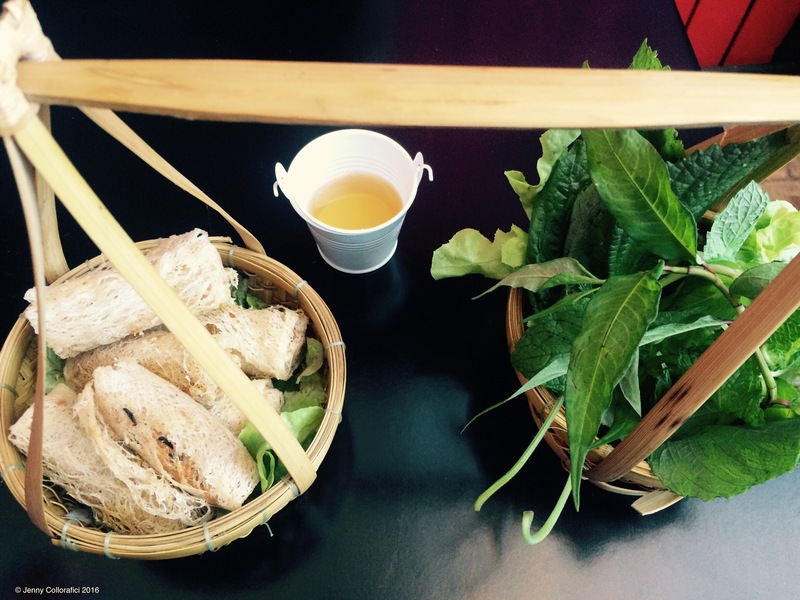 You take a spring roll & wrap the mint & lettuce around, dip it in the sauce and take a bite. The cool & freshness of the leaves envelope & embrace with the crunch of the spring roll coating and the warm tasty filling is a wonderful balance of flavours. 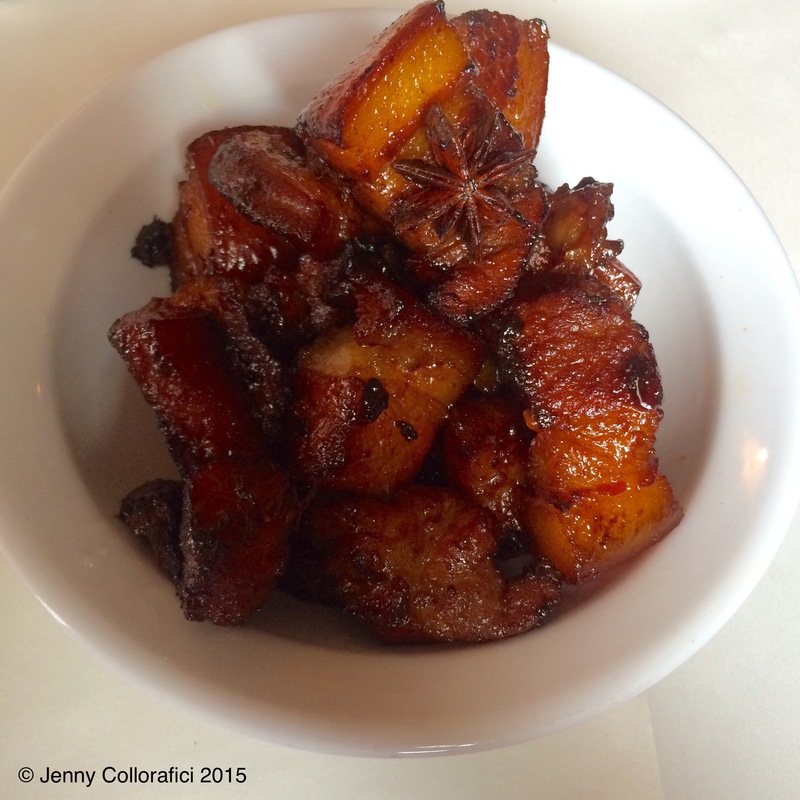 I could & have eaten a whole serving … Need a Winter Warming dish?! 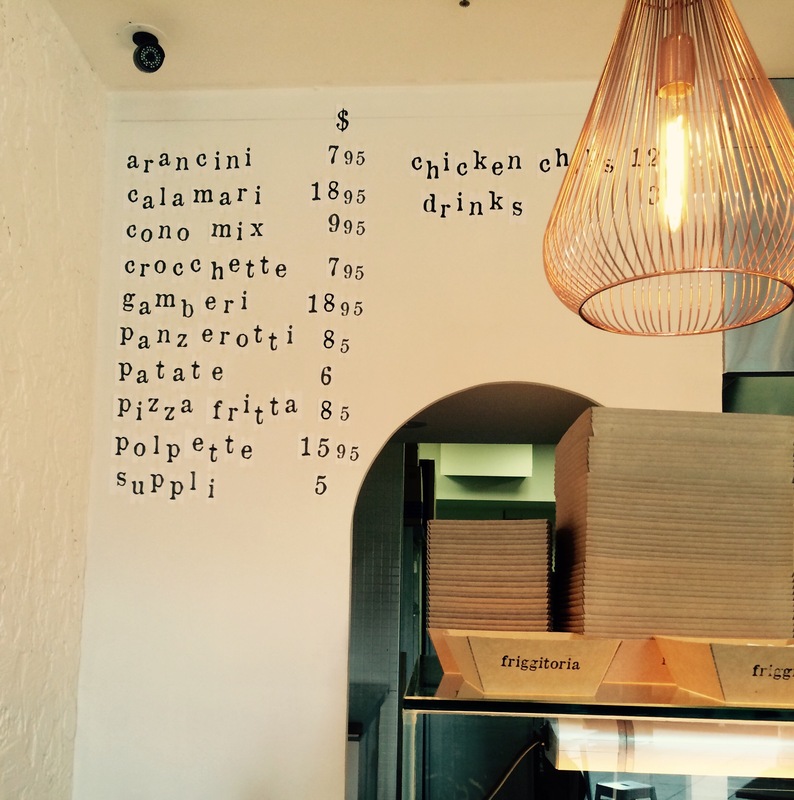 Well Hem Nine Nine have a great selection of PHO – sorry there are no photos of this & it will be Part II soon. 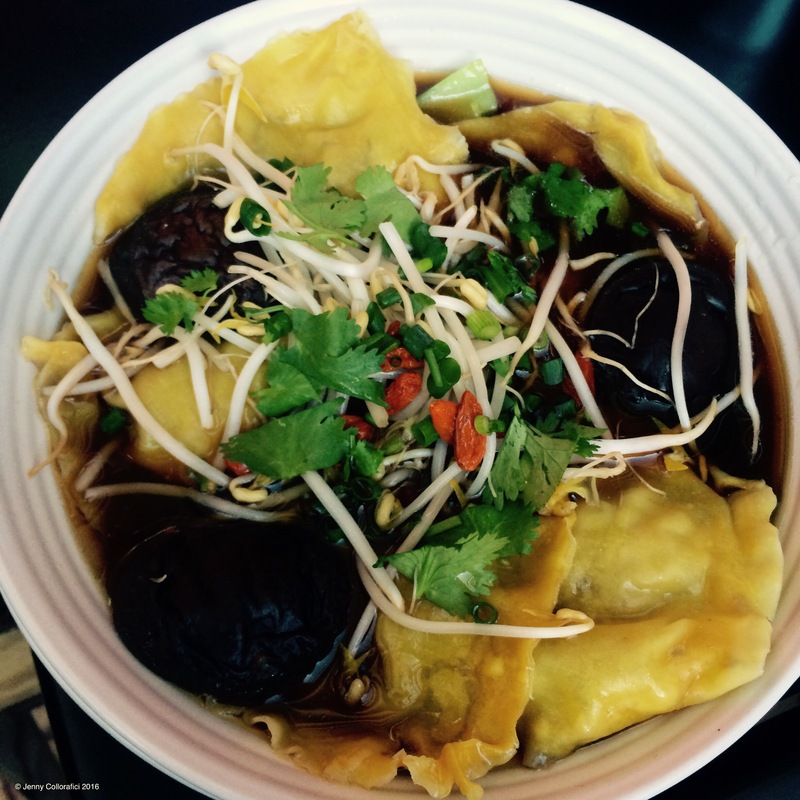 But I did have a tasty Duck & Mushroom Wonton Ravoli – it was actually not what I expected being in the broth but very tasty and hearty. The ravioli were very generously sized & soft. I am no stranger to trying different and unique dishes. Tasty dishes are often happen when you least expect it. 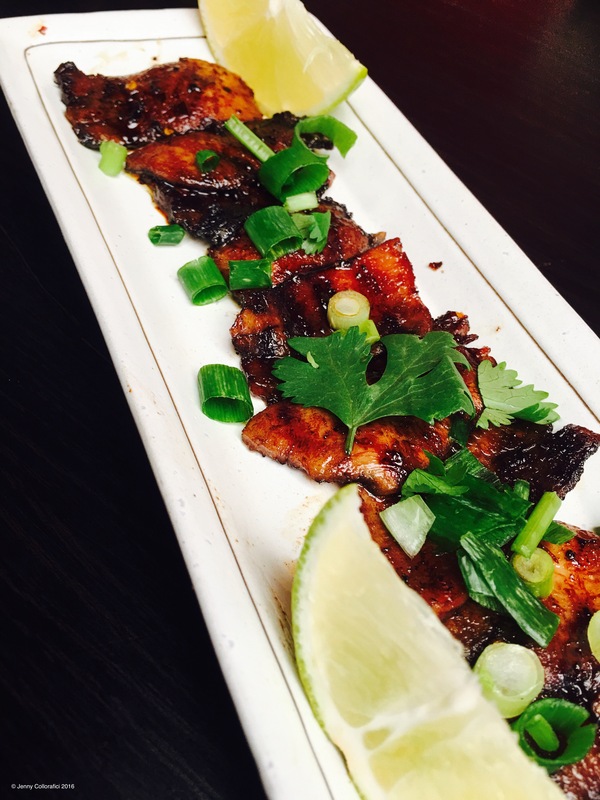 Grilled Ox Tongue in XO – twice cooked Ox tongue marinated in spicy XO sauce & a squeeze of lime. This “special” dish is not chewy at all but more “melt in your mouth” tender bite, more-ish dish – it’s just not enough! Next are the Steamed Baos – soft, steamed bun, pickled cucumber and baby radish with the options of pork belly, crispy skin chicken, spicy tofu. 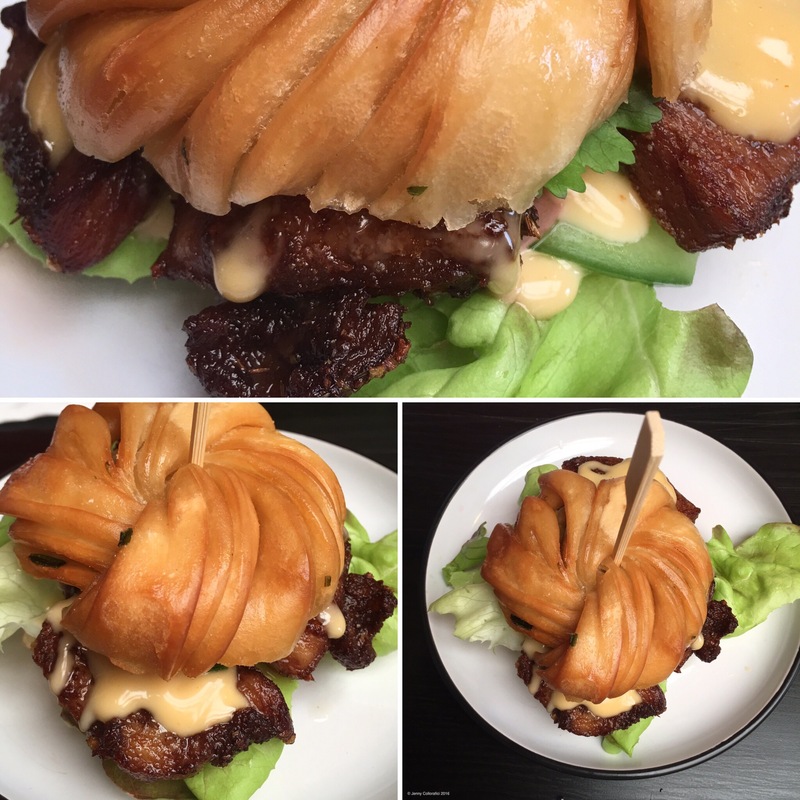 Look at this Bao … You can already see how the bun looks – so soft & just airy. With just a few fresh ingredients sliced to perfection and a juicy helping of pork belly it’s the delightful dance or fresh vs mouthwatering mix. Last but not least – alas there is no dessert as I already over ordered but I had one of the most prettiest dishes I’ve seen! 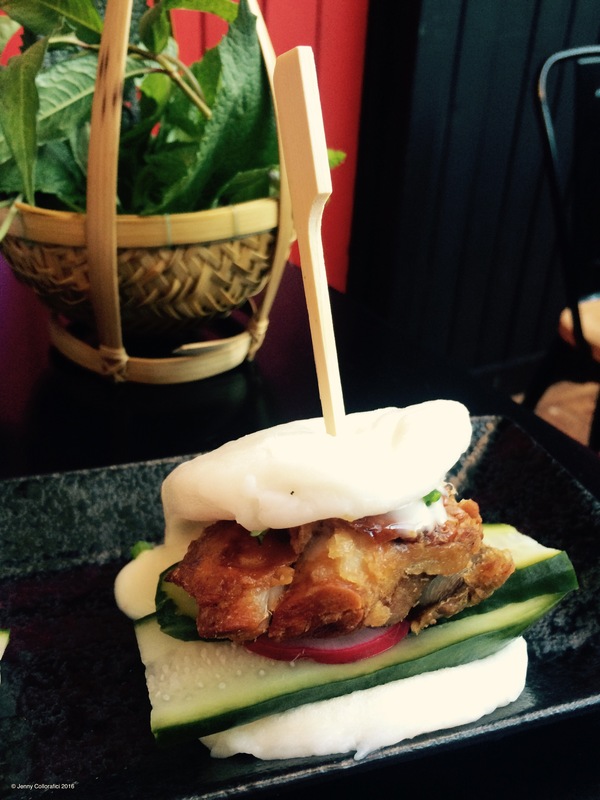 Pork Chop Slider – fried lemongrass pork chop, pickled cucumber, lettuce and baby radish, chilli mayonnaise. 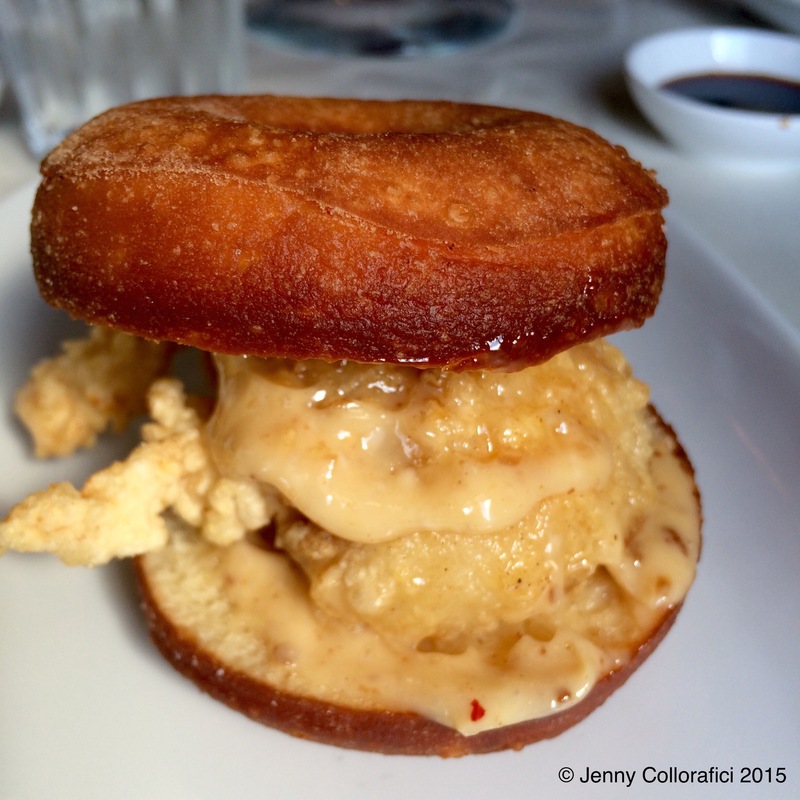 Served on a crispy shallot mantou bun. WOW as a visual it’s just so colourful and eye pleasing. The pork chop is juicy, tender & flavoursome and chilli mayo has the right amount of tantalising heat! … Now to talk about that mantou bun – usually they are steamed in Chinese tradition but in this case it’s been crisped & fried with a crunch – yet still soft on the inside. Anyways readers, all this take about food is making me immensely hungry for this tasty Viet treat! 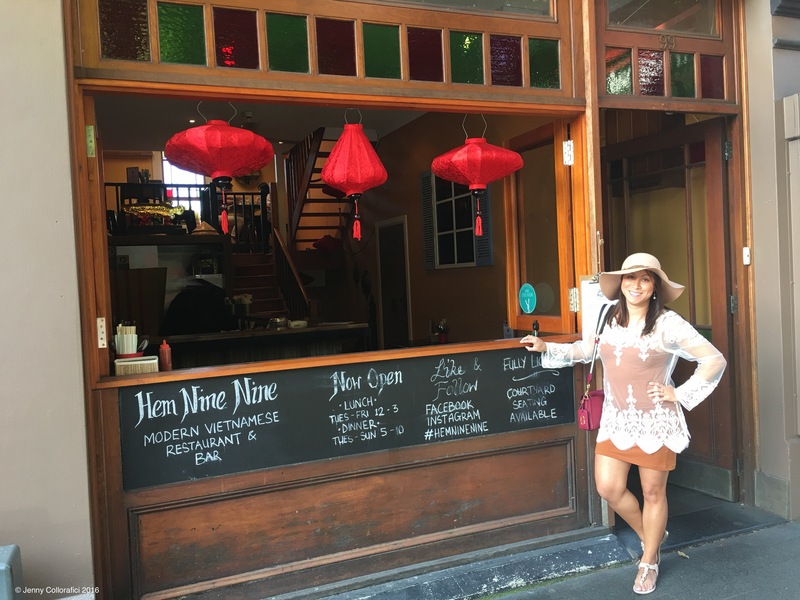 I will actually be heading there this Saturday night so I’m sure I will be taking note of more delectable dishes … Sydneysiders – pls trek down to the Inner West & try Hem Nine Nine in Glebe! 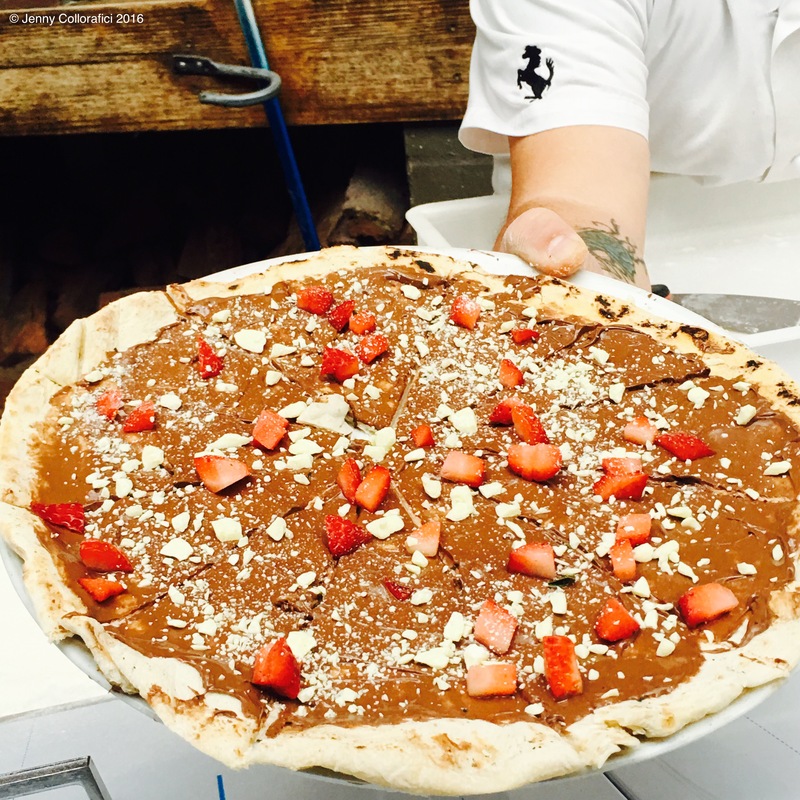 READERS: please stay tuned – there will be a chocolate cake post coming up and my adventures when doing a Woodfire Pizza Making Class! I’m am LAME … I let life get to me and literally “I am very busy” to even keep up on the bloggage. So almost-midyear-resolution is to put my blog back on the map & back on the road … Here I go … FYI – This blog post, long overdue & from last year – YES, lots of catching up to do! 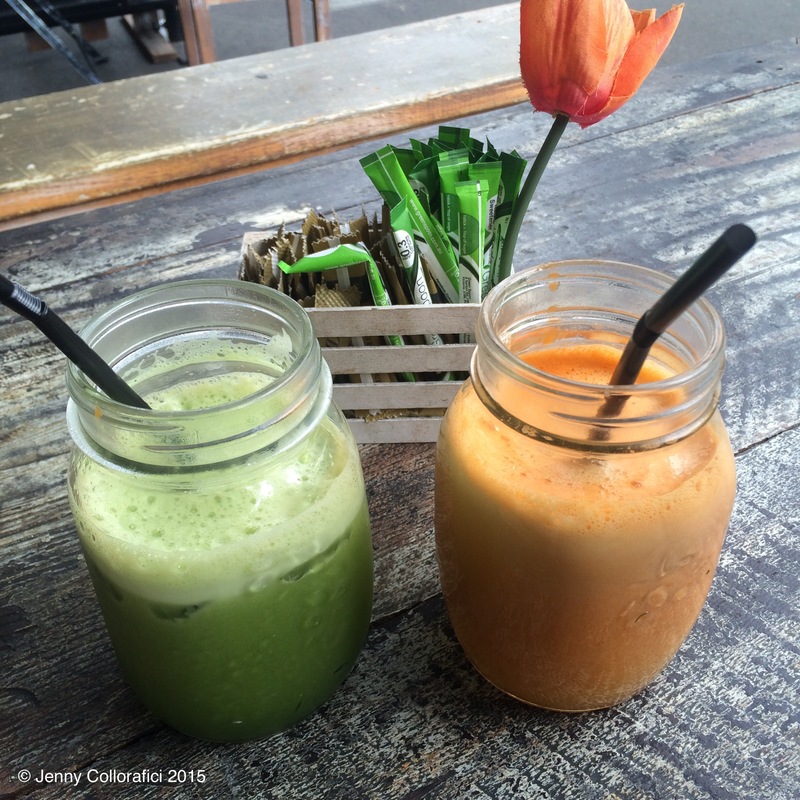 … And I really do miss blogging … PLUS I have so much to tell you not only about Sydney but also from my travels – Philippines, Japan & Italy. 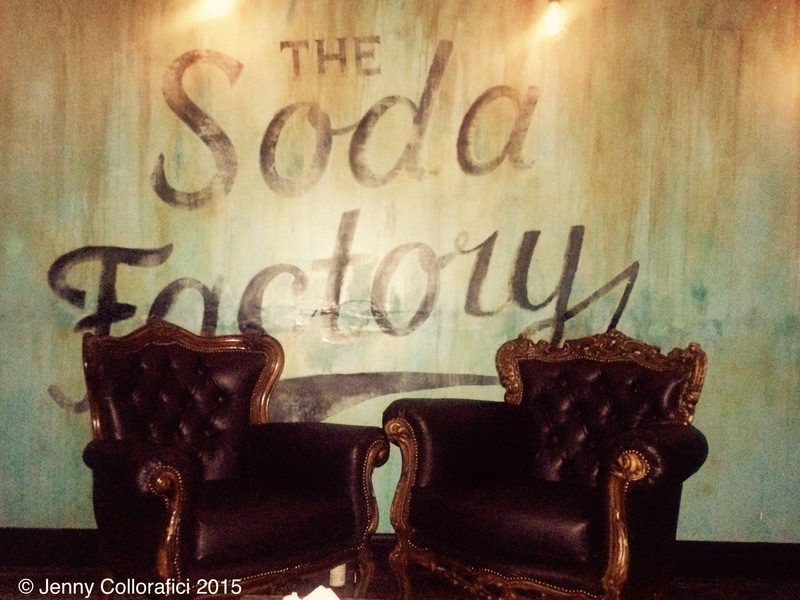 Soda Factory is a fun-filled place in Surry Hills … Ballin’ on a budget?! Scrounging around for gold shrapnel for a feed?! 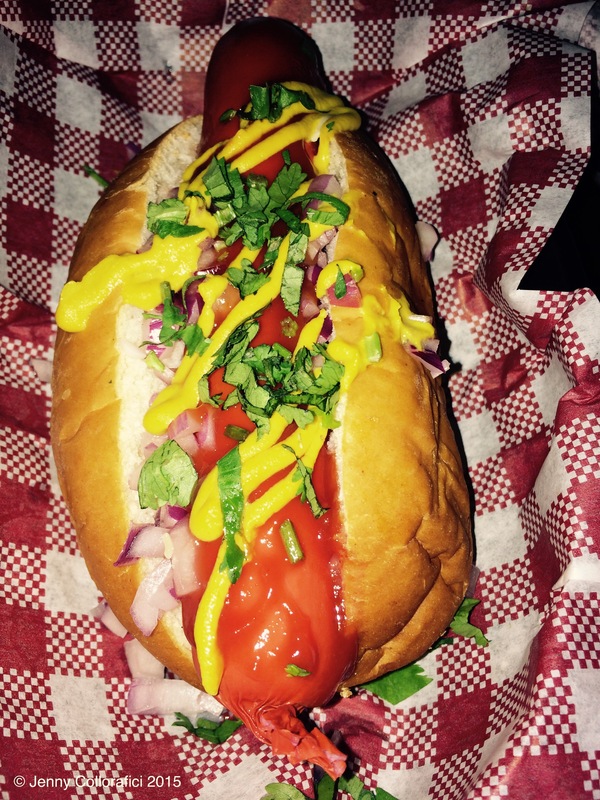 I love cheap Tuesdays and with $1 hotdogs you can’t go wrong … Casual chilled bar with easy eats & drinkable drinks. 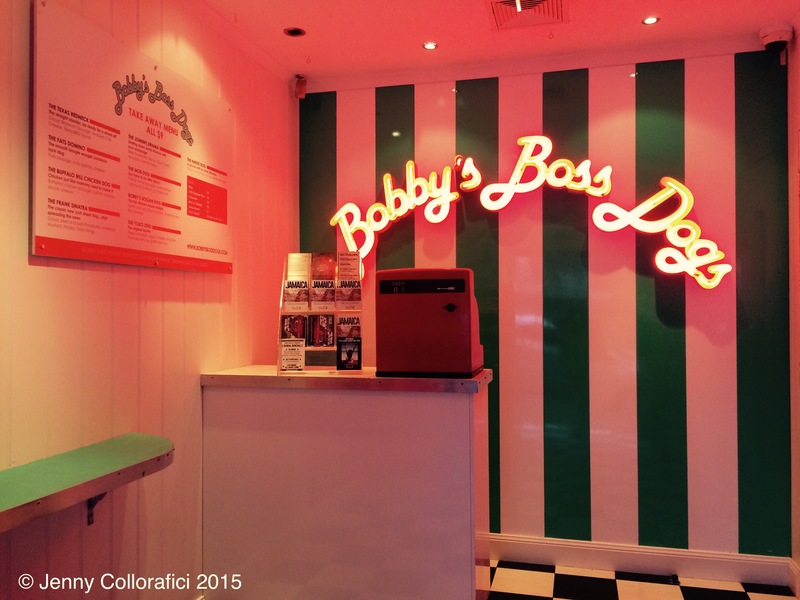 Upon entering it’s a random-colourful-looking-retro-entrance “Bobby’s Boss Dogs” signage is tricking you to almost think that you have stepped into the wrong bar until you walk through the Coca Cola fridge. 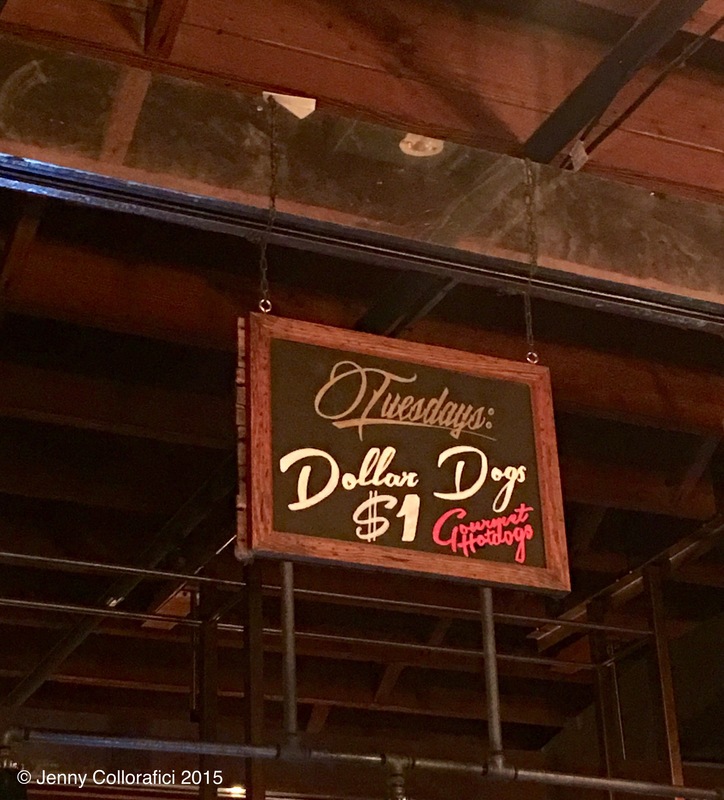 Tuesday menu is a little different to other days – every day features different type of “special” such as a cheapo deal or possibly a complimentary freebie. 4) Chilli Cheese Fries: shoestring fries with homemade beef chilli & nacho cheese. I am a fan of fries – gimme some hearty fries with anything really … But melted cheese & beef chilli?! 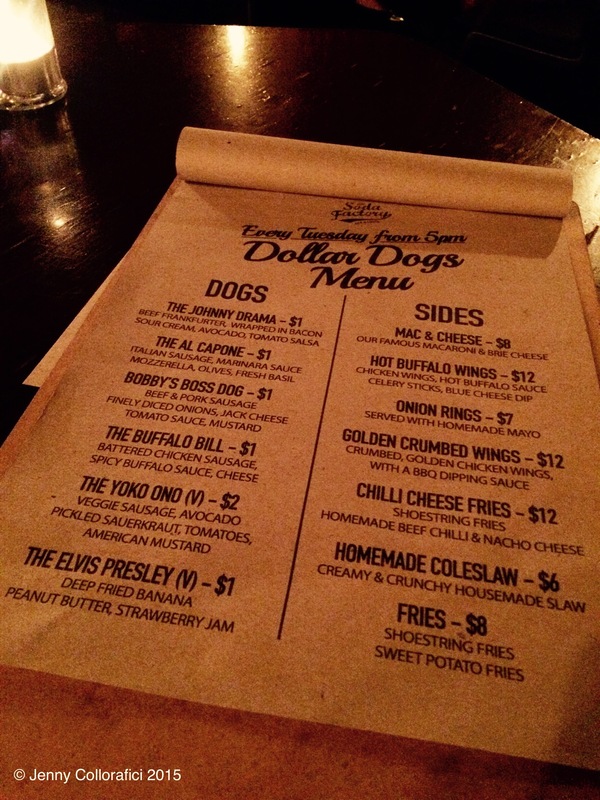 … Def hit the tastebuds – real comfort food. DESSERTS spells STRESSED backwards … Why did I say that – well that’s my life, when I am stressed, I have dessert hahaha … Or it may be the case of me making up excuses just to eat dessert … I do have a sweet tooth though and this will never change … Everything with a “balance” so one small sweet is OK right? 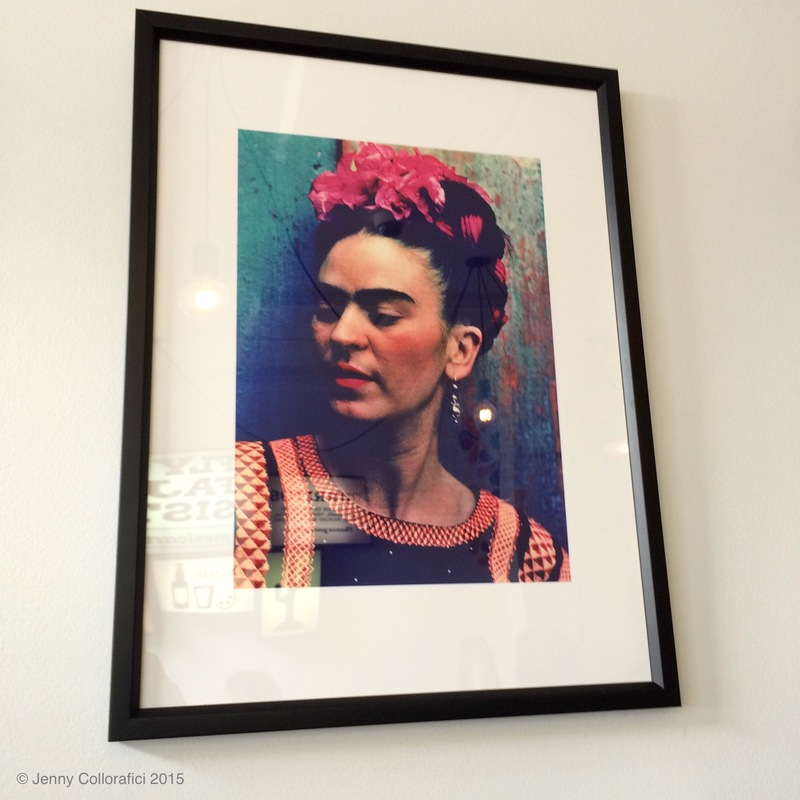 Mini Post: Fly my Fajita Sisters! Back again – I would like to introduce you to my first “mini post” – gonna insert them in when I can. 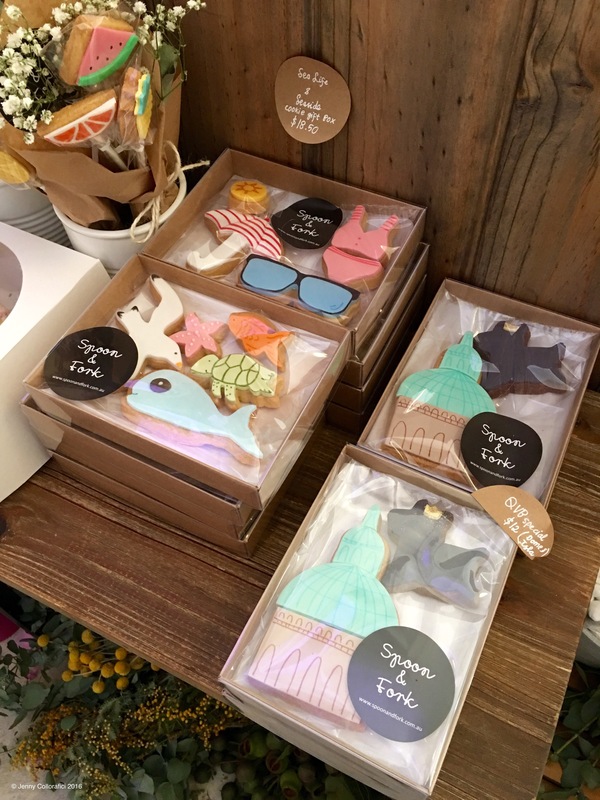 Generally they will be food or fashion focused and revolve around a mini meal I have had – maybe a light lunch or a quick bite on the go … Or a quick purchase I wanna share with the world! And just because it’s a shorty, doesn’t mean it won’t be a goodie. 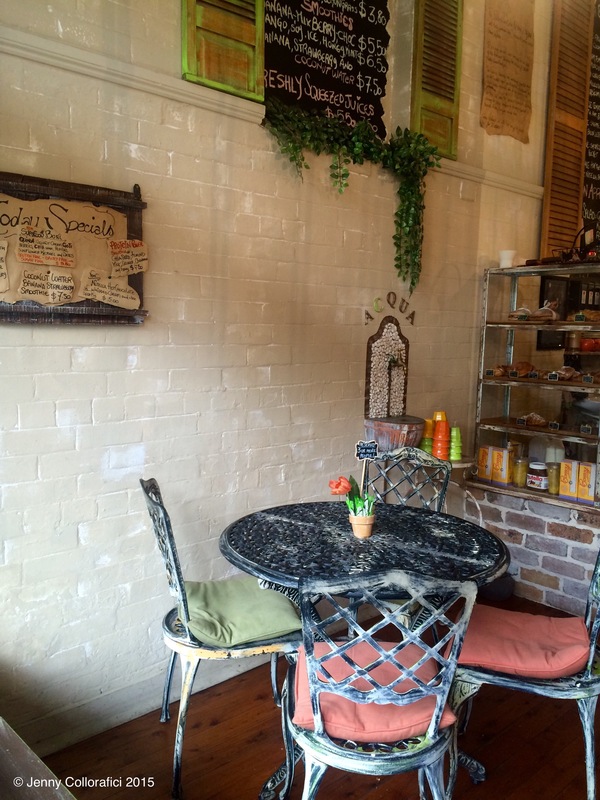 Living in the Inner West area of Sydney around Glebe gives a lot of variety when it comes to food – whether it’s a stone away in the city or juat a few streets up. 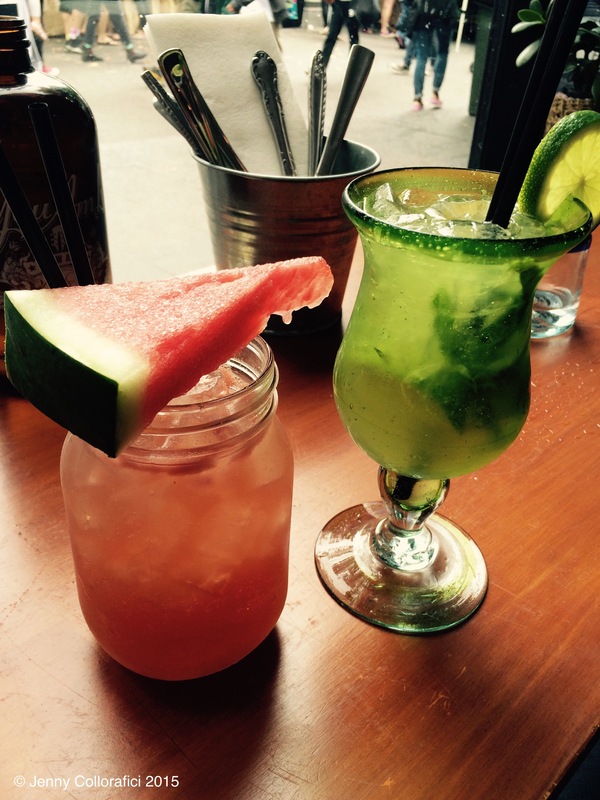 * BASIL WATERMELON COOLER $15 – Absolut Citron, basil, peeled ginger, watermelon, fresh lime juice topped up with ginger ale. * FLYING MOJITO $15 – House infused Matusalem Dark Rum, mint, lime, coconut, sugar. 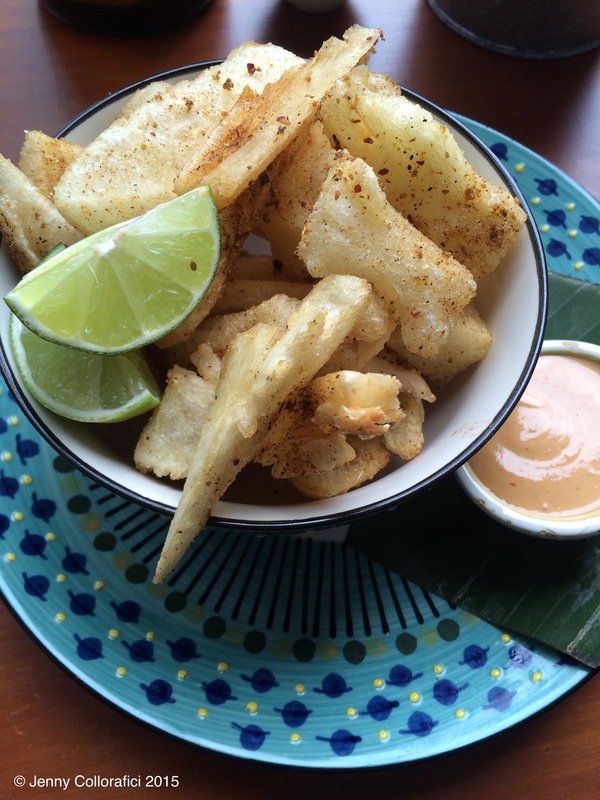 Yucca Fries ($7) – Corona Battered Yucca – which is casava root served with a wedge of lime and chipotle aioli. Casava root is a vegetable all in the same family of the potato, yam, taro etc which is starch-filled & perfect as fries – they taste soft with a bit of bite & a tad of fluffiness – love the slight crunch and then don’t forget to dip in the chipotle sauce – it’s a hint of heat. 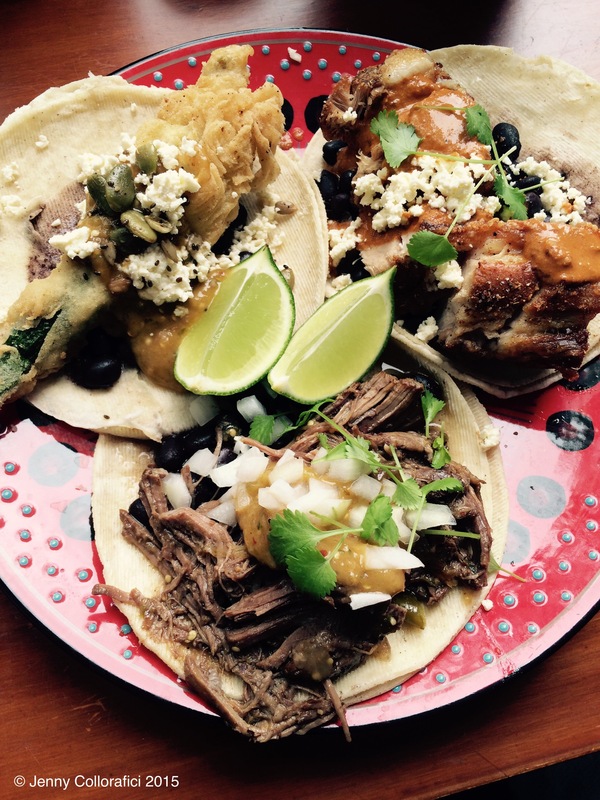 Trio of Tacos ($18) – is there nothing better than small bites of tacos?! Sampling a trio of fillings is a feast enough to please the eyes & tummy hunger … All tacos are served on soft corn tortillas with queso fresco which is a fresh Mexican cheese that’s creamy & soft in texture with a very delicate taste – traditionally made from fresh cow’s & goat’s milk. Small eats are so deceiving as they look as though it won’t be enough but I love the generosity of the portion – mission accomplished. 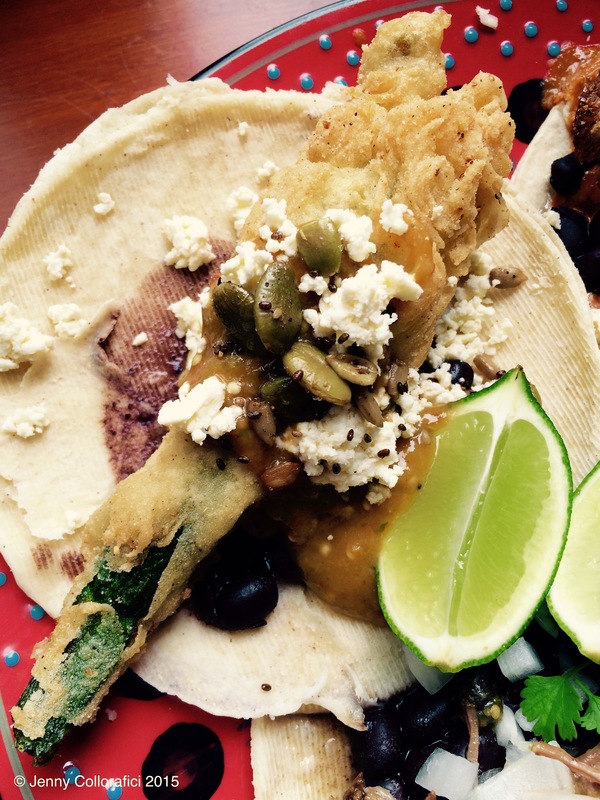 1) Beer Battered Zucchini Flower with Chipotle Sauce – I love love love zucchini flower! If it’s on the menu I will order it so fast … The zucchini flower has a beautiful golden crunch dancing with the heat from the chipotle sauce, cheese, beans & rounding it off with a squeeze of lime. 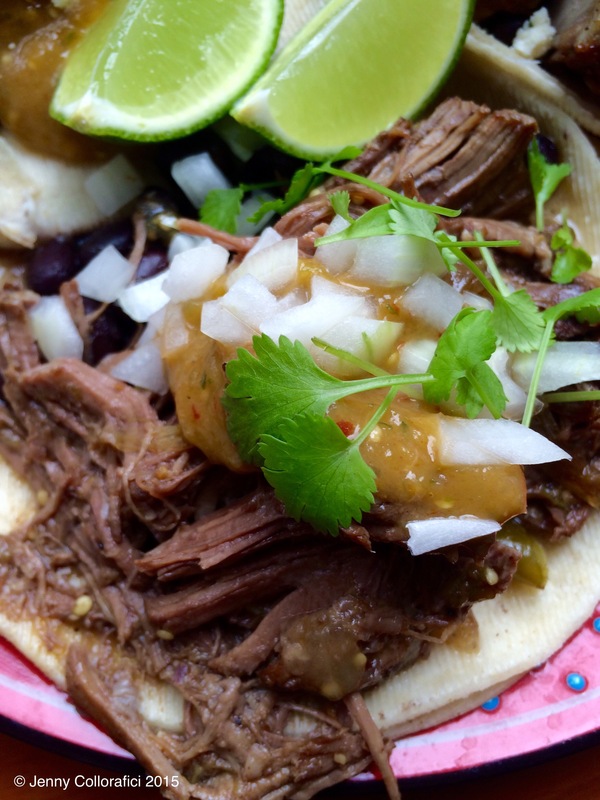 2) Tomatillo Braised Beef, Black Beans and Chipotle Sauce – beef cooked until it falls apart and melts in your mouth – gotta love it. It’s tender, flavour-filled and matches well with black beans married with the fresh sprigs of coriander & a squeeze of lime. 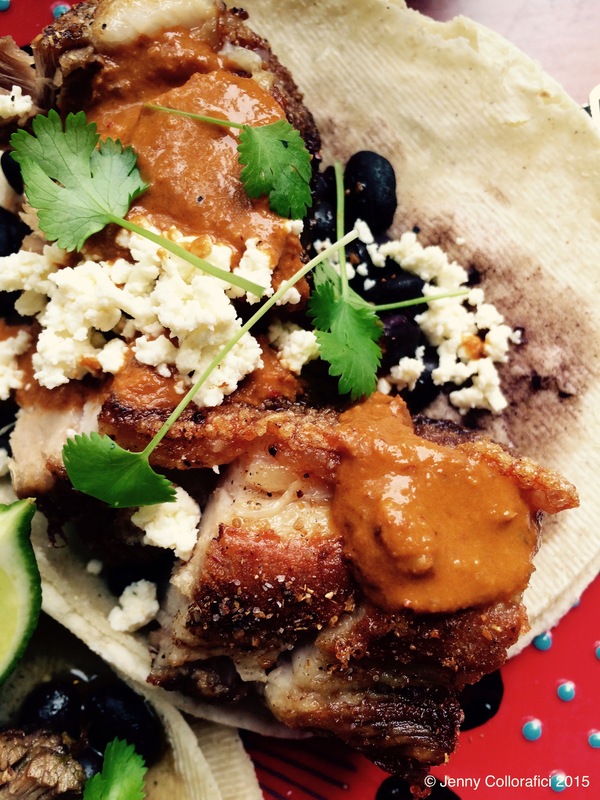 3) Crispy Pork Belly, Black Beans, Salsa Almendrado – the pork was the standout and well-deserved an ovation in this taco. 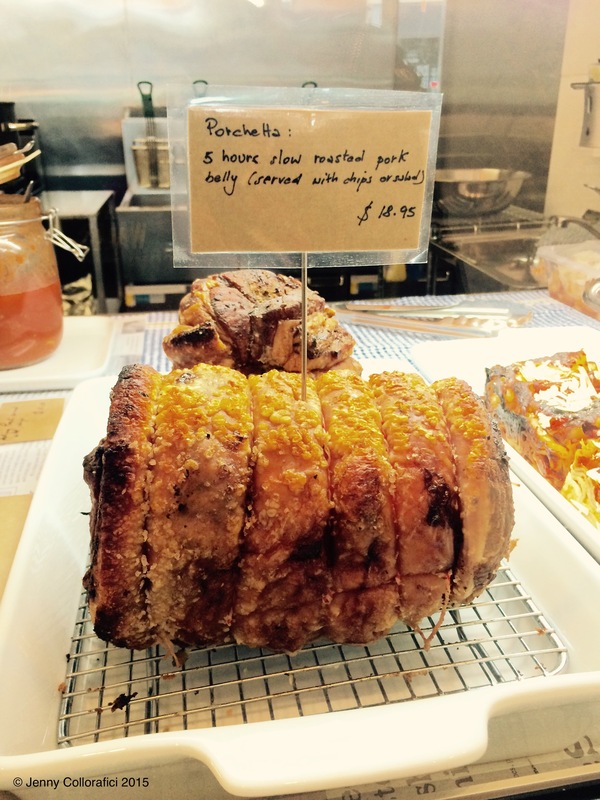 With it’s juiciness of the meat & the crackling had the right amount of crunch – the end. 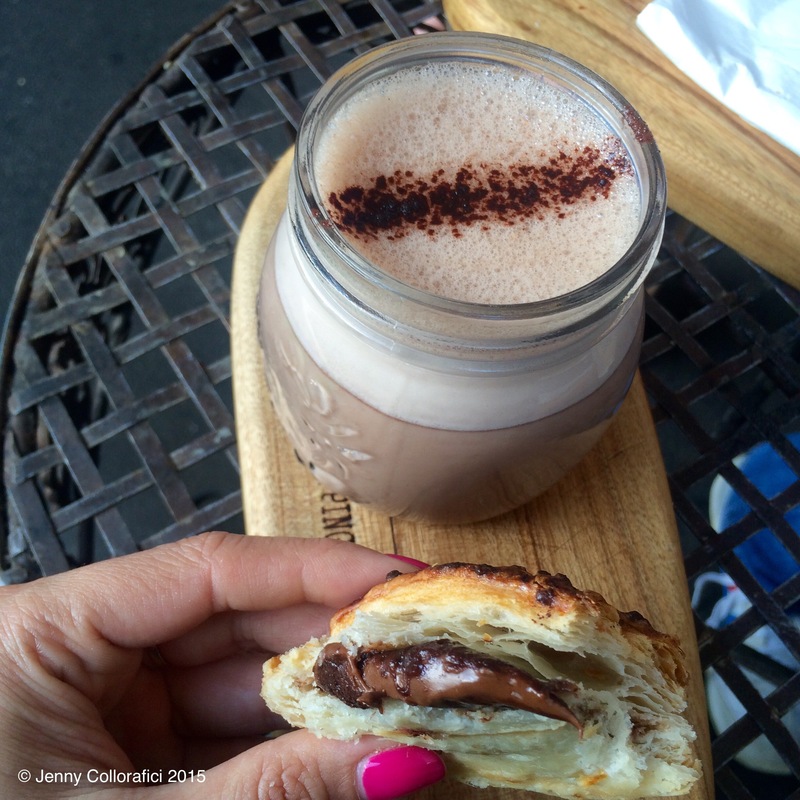 That day I craved DESSERT – that day no quick lunch was complete without dessert. Presenting the Chocolate Cake (multiple photos are necessary) – Chocolate Pistachio Brownie with Chocolate Ganache, Cinnamon Anglaise topped with fresh cream ($12). This is a very gorgeous & elegant dish wrapped as a phenomenal tasting dessert. The cake itself was a layered surprise as it was very much like a soft creamy brownie and then a a layer of smooth chocolate ganache – balancing so perfectly well that it’s not too dense or heavy. 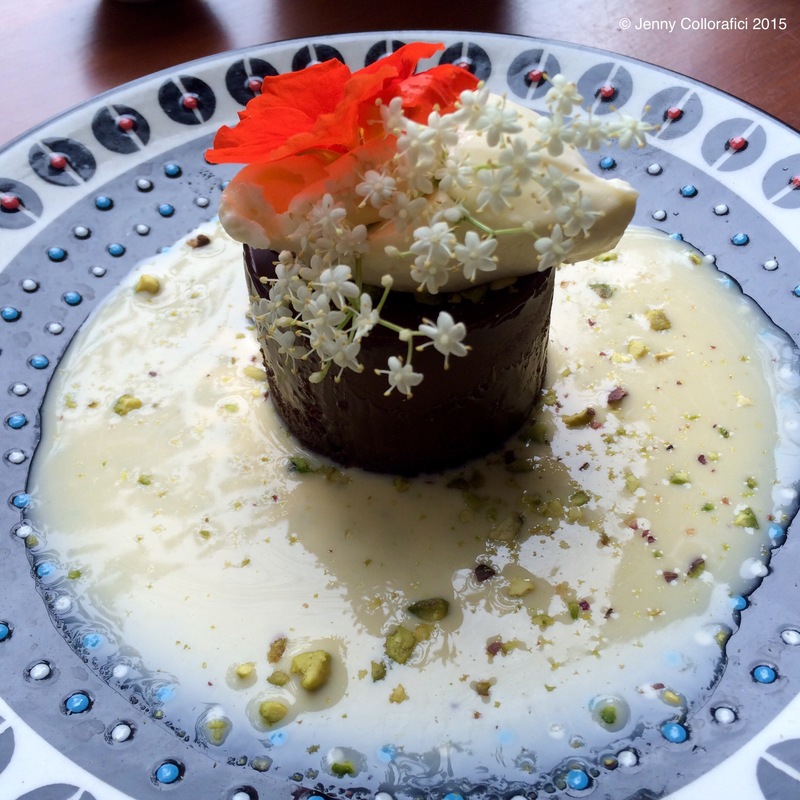 The cinnamon anglaise was the enveloping showstopper that tied the ribbon – it was so delicate … And the final finishing touch of sprinkled pistachio nuts. 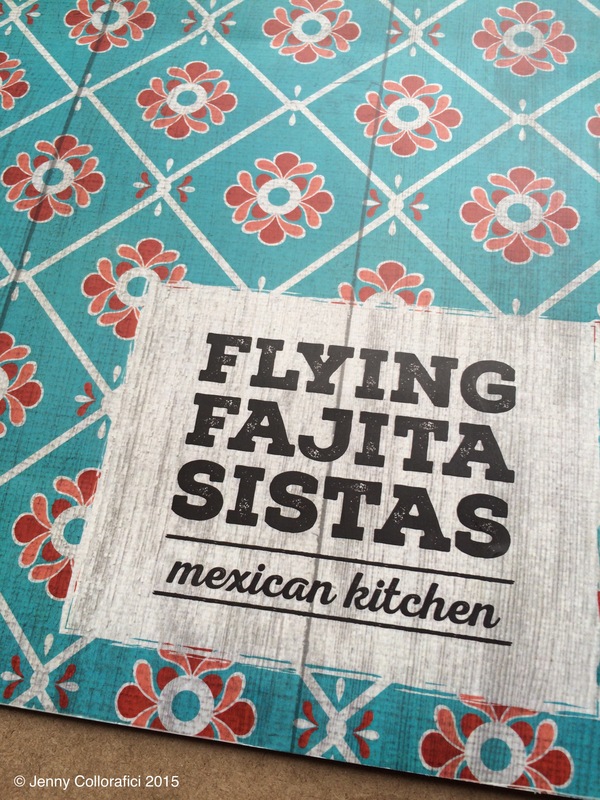 Flying Fajita Sisters is a modern place adorned with splashes of Mexican history, tradition and culture. 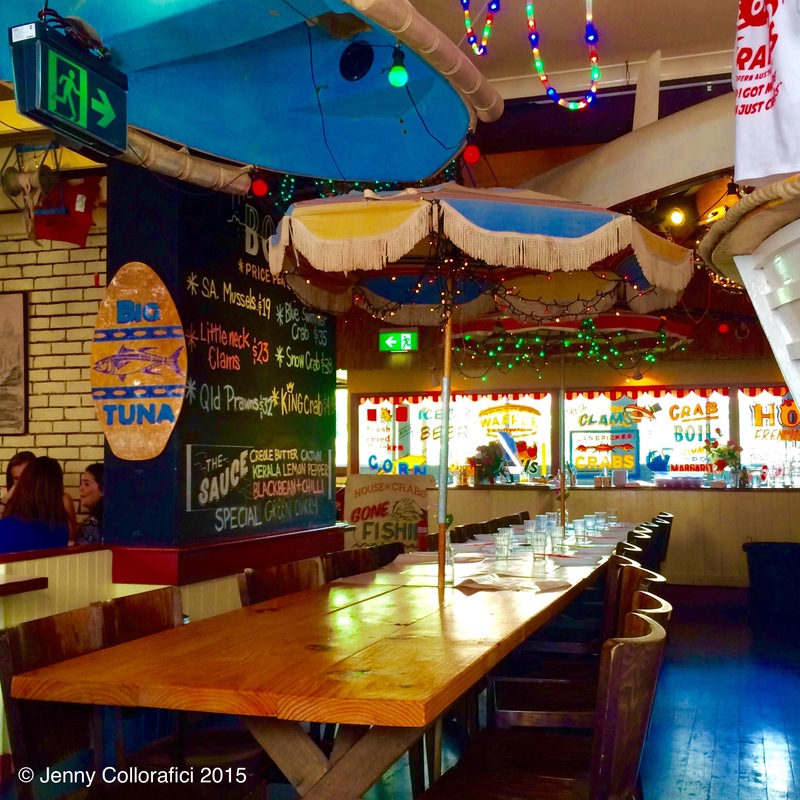 I love this place because it’s so fun and so energetic – from the buzzing crowd during the day or night … it’s the fragrant Mexican-inspired dishes … to the extensive hot sauce racks and extensive bar/drinks. 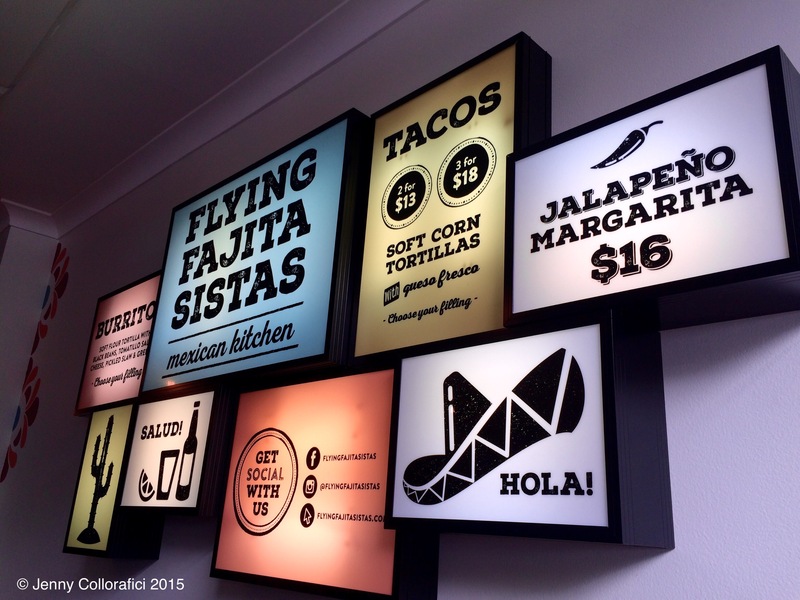 Til the next mini or post to the max … Please continue to join me on the ride of food and fashion … In the meantime: Sydneysiders in the Inner West area – get your Mexican fix. Back to my Italian roots again and back to being my food-focused self. I’m totally getting faaaaa-t and it’s OK – must go for a run tomorrow … Actually I’ve been incorporating A LOT of walking into my life – especially to & from work! If I am going to indulge in such delights, then I must have some sort of balance right?! 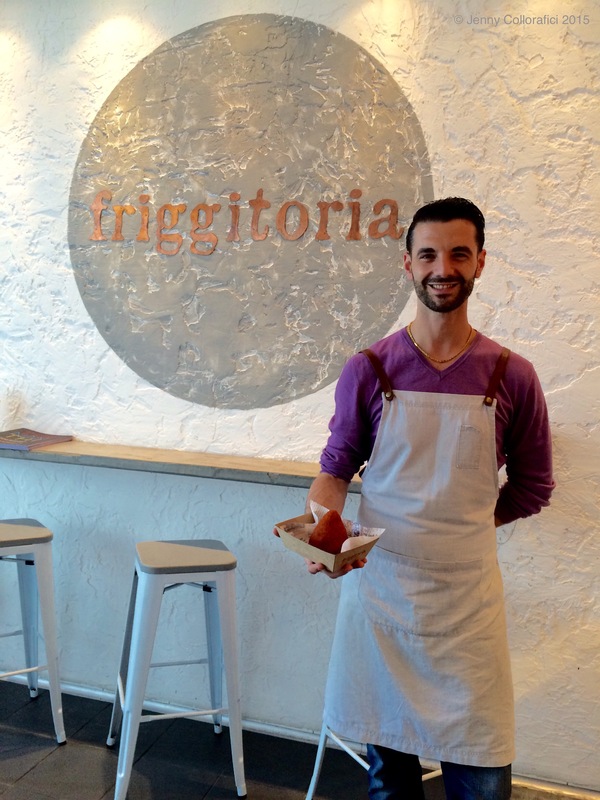 … Anywho … Food – FRIGGITORIA http://www.friggitoria.com.au/ is located in Kings Cross and it’s bringing Italian Street food to Sydney! 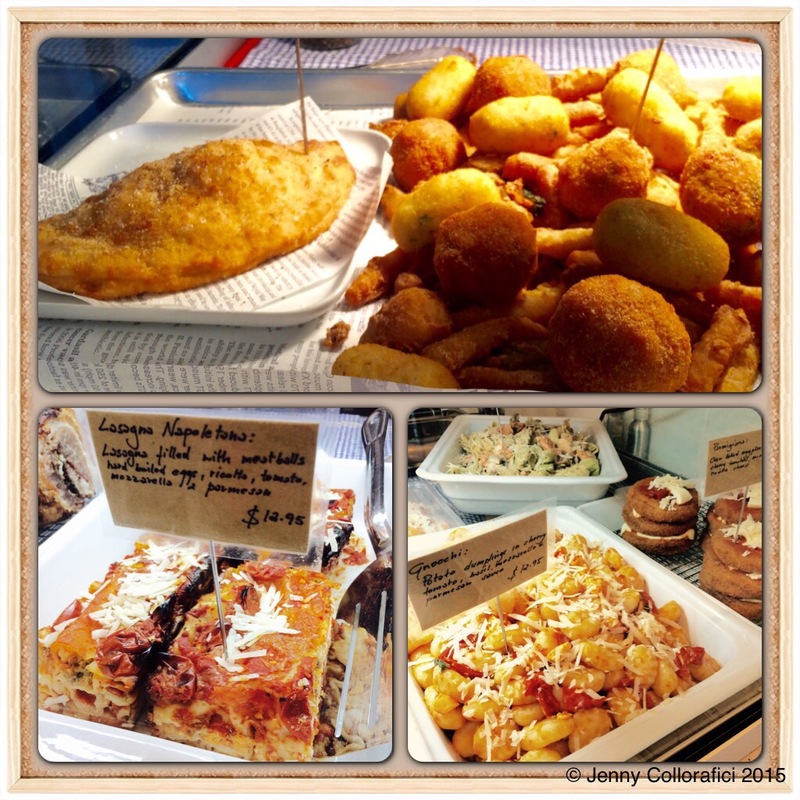 My very first experience with Italian street food was arancini – it’s a stuffed rice ball filled with ragu bolognese & mozzarella cheese rolled in breadcrumbs and then deep fried – originated from Sicily (southern Italy). So bad yet so good for you. 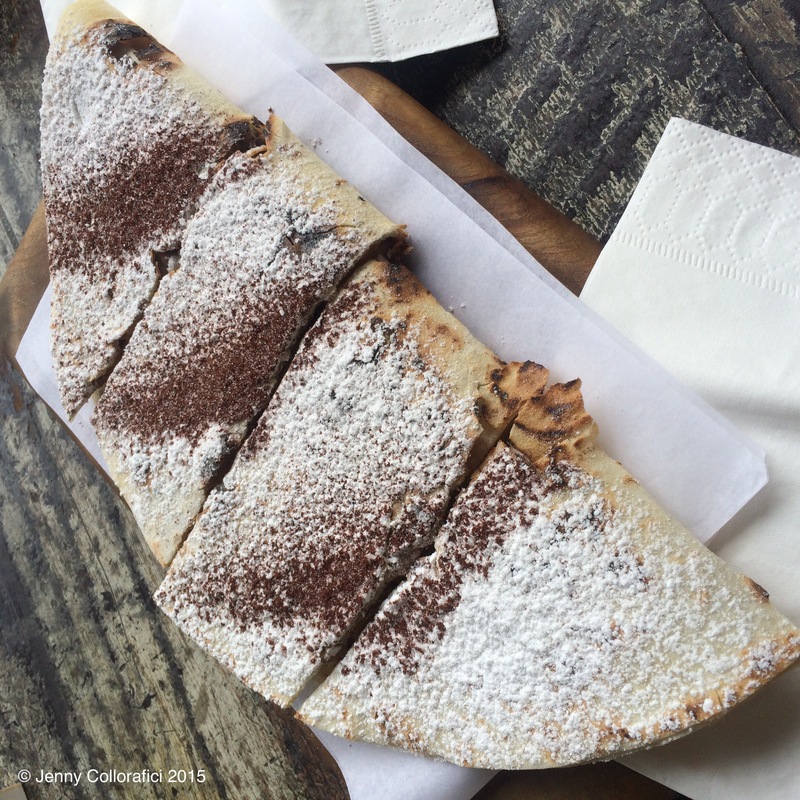 It’s a “sometimes” food even though I could easily have it every day (totally did that in Sicily) … Sorry I’m getting sidetracked – this post is a shorty but a goodie … Simone is 100% Italian and has so much passion when it comes to educating and spreading the Italian food love around Sydney. It reminds him of his days in Italy – especially after a night out drinking, a typical meal to have (oil = soaks up alcohol). 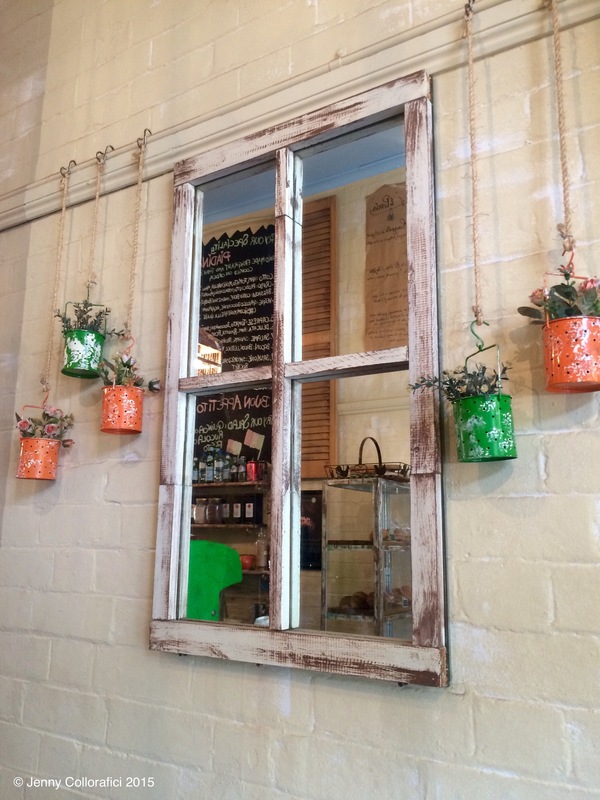 I love places like this – “hole in the wall” – such a small place brings so much happiness! The simplicity of the decor brings a modern, clean and rustic feel with the textured walls, simple stool seating, dark timber table tops to the the golden copper lighting fixtures adding a contemporary twist. 1) It’s deliciously sinful dripped in indulgence. 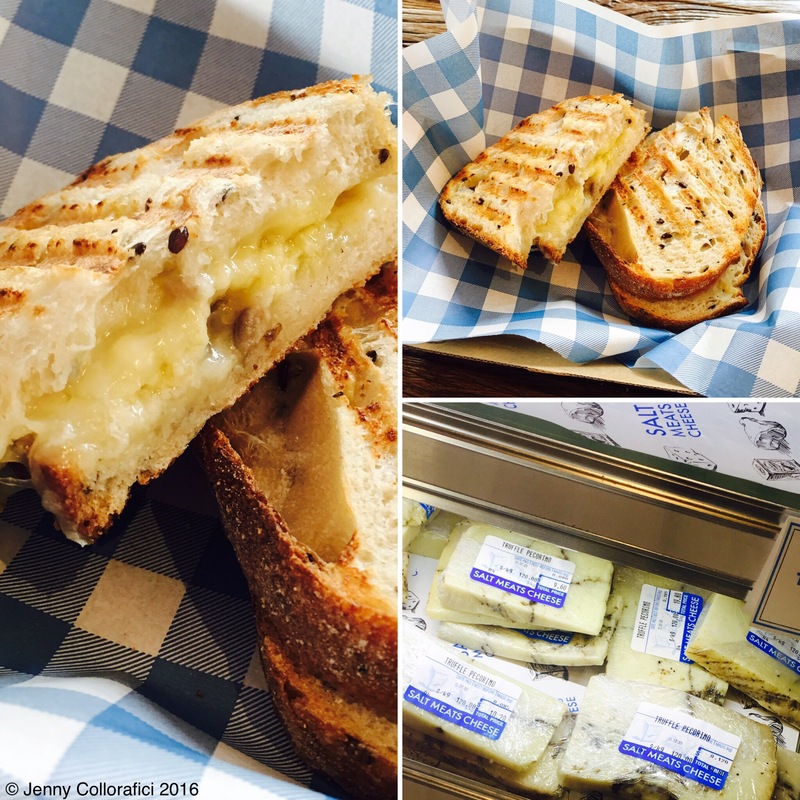 This food delights the tastebuds, opens your eyes & empties your wallet – all for a good cause of course. 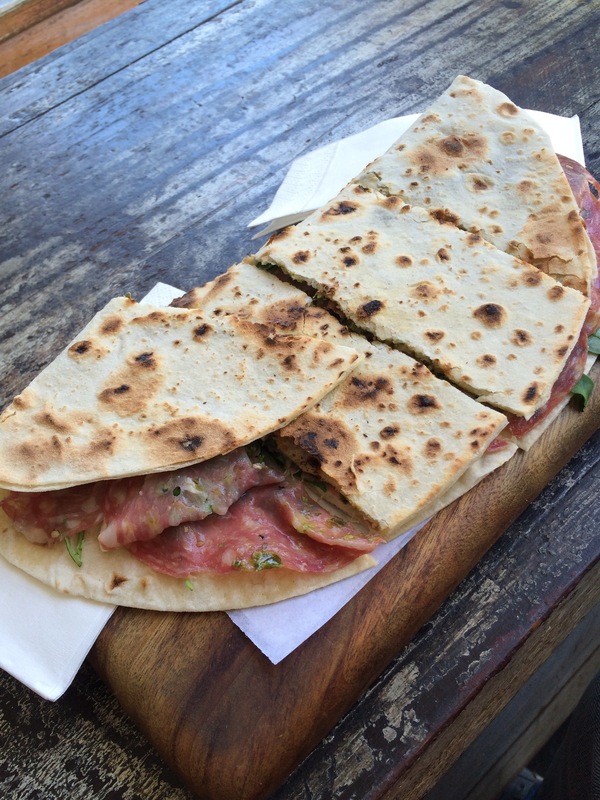 3) It’s Italian – enough said. You can taste feeling, pride & strong passion in their food. An array of foods are served – from lasagna … to eggplant parmagiana stack … to gnocchi … are just some of the dishes ready for the taking. 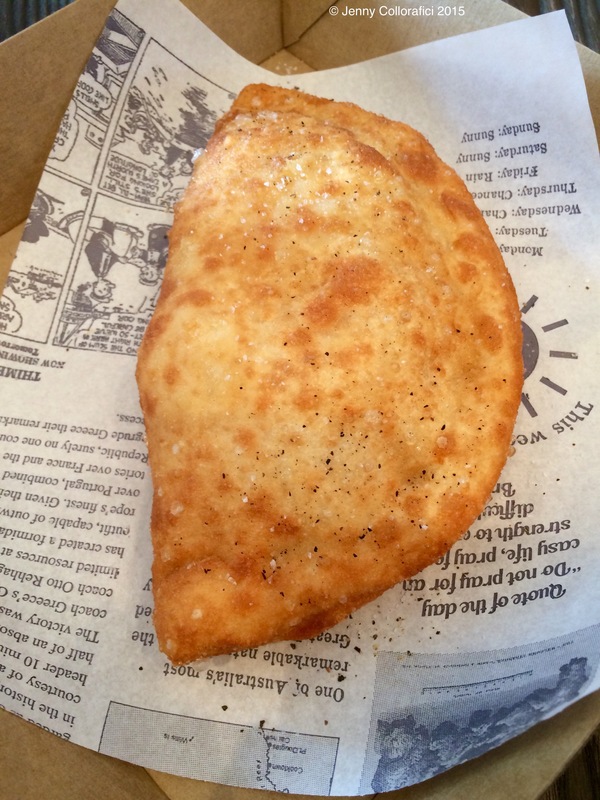 Panzerotti – like a mini calzone deep fried filled pastry-type-pie with melted cheese & tomato (or various other fillings). 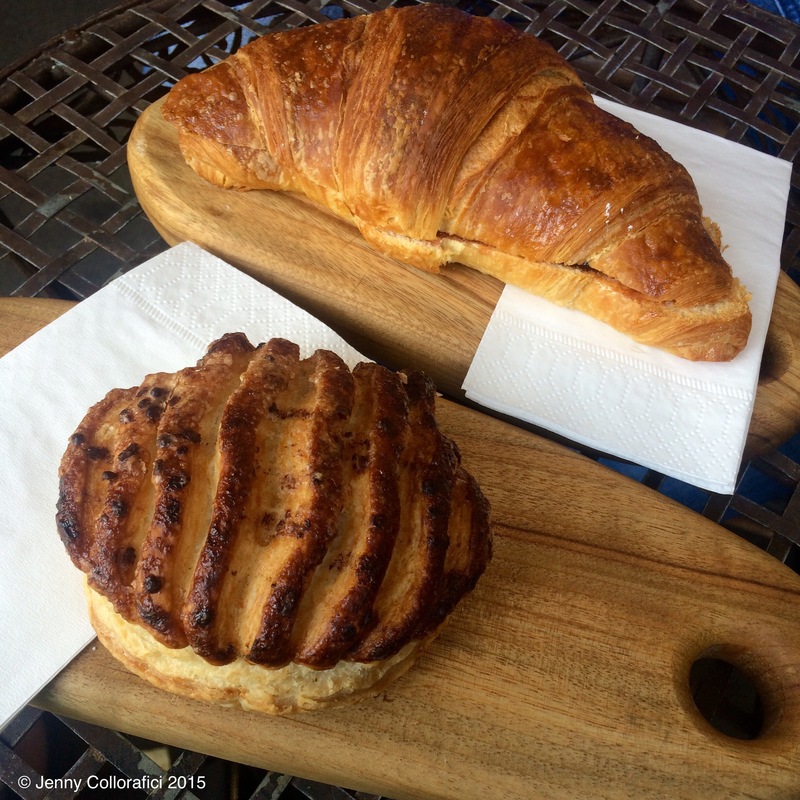 It’s crunchy on the outside and soft & doughy on the inside. 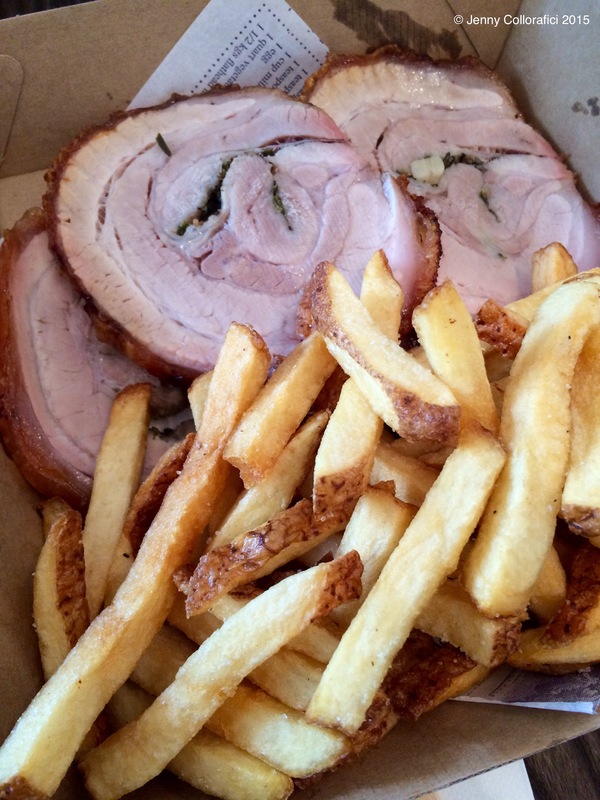 Porchetta – I am not vegetarian and eating meat (especially pork) is etched into my heritage – both Italian & Filipino cultures live with pork. Now imagine roasted pork belly cooked, slowly roasted with herbs – juicy on the inside with the crunch of crackling on the outside. 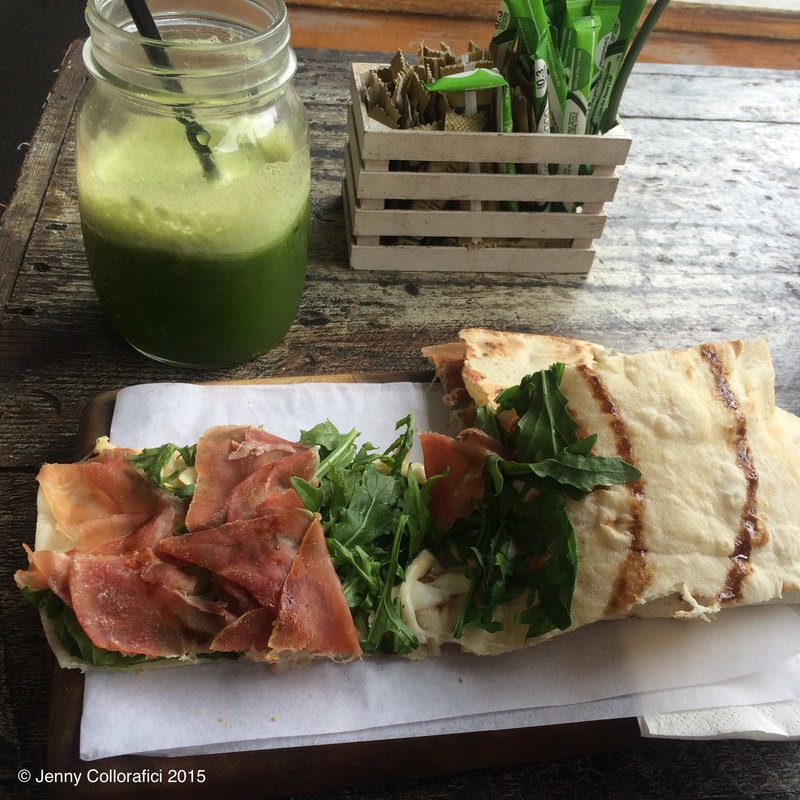 We had this served with the chips … Salad WOULD have been the better option but I really needed the energy to survive the Sydney Harbour Bridge Climb that day! I love their chips as they are rustic, handcut uneven in size – keeping the crunch of potato skin and the soft fluffiness of the potato. Cono Mix – this is a fried mix (bite size) perfect street food! 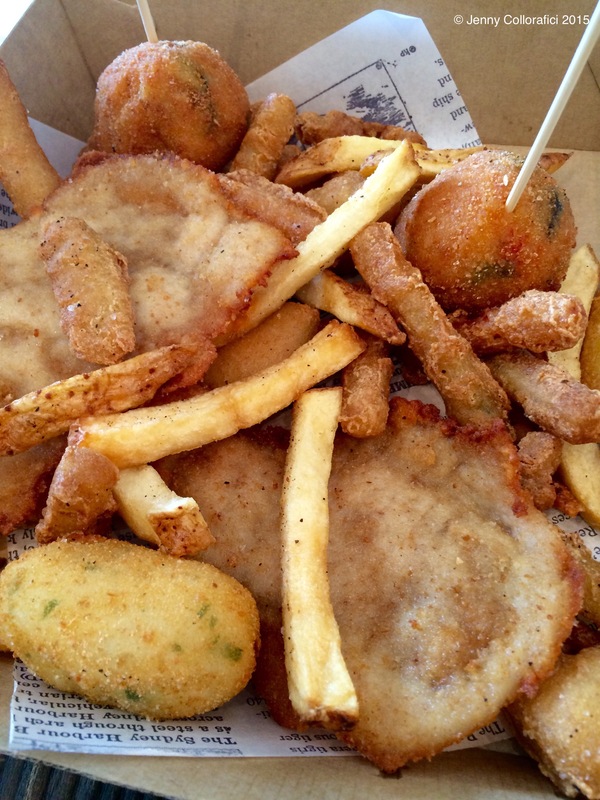 A mix of deliciously bad (yet deliciously good) – mix of chips, mini arancini, croquettes, flattened crumbed chicken breast and vegetables. It’s easy to eat as a snack or addition to a selection of other dishes! Good food needs to be simple – sometimes there is no need to overcomplicate or change the rules. 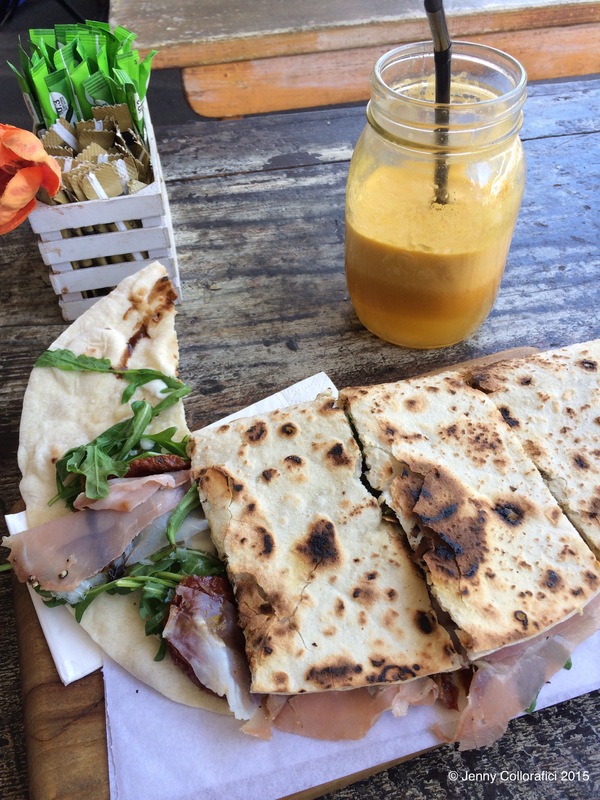 Stick to the tradition and you really can’t go wrong … With Italian food sometimes there may be a slight adaptation but the food flavour & combinations stay true to the culture. 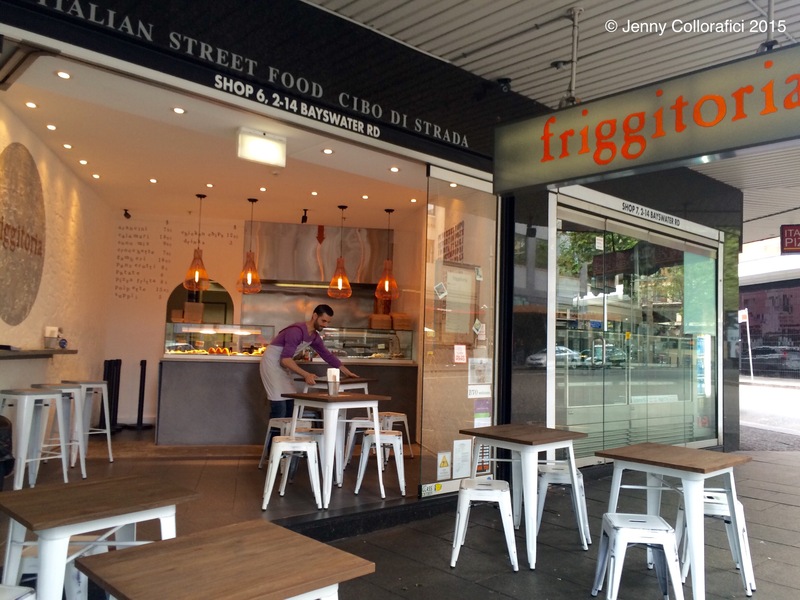 I recommend checking this place out and follow them on Facebook … I am definitely planning to return as they tend to have new specials on the menu on a weekly basis and note that they also do delivery with Suppertime: http://www.suppertime.com.au/friggitoria Til next foodie post … Another one is on the way and I totally need to catch up with all of this and release more, more and more! 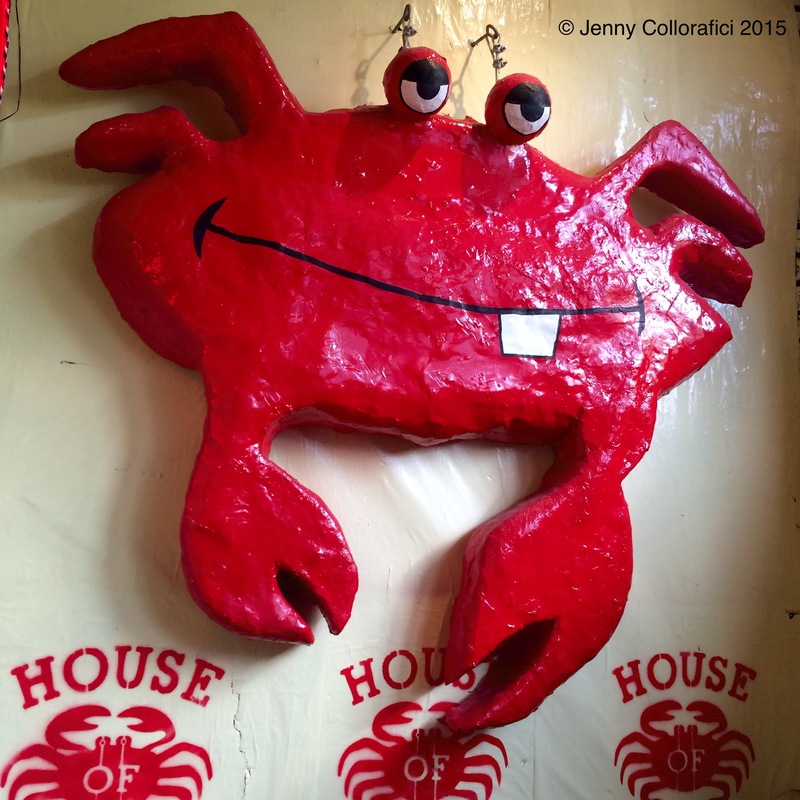 Yum to the Cha at House of Crabs! Raise your hand if you lurvvvve Yum Cha?! 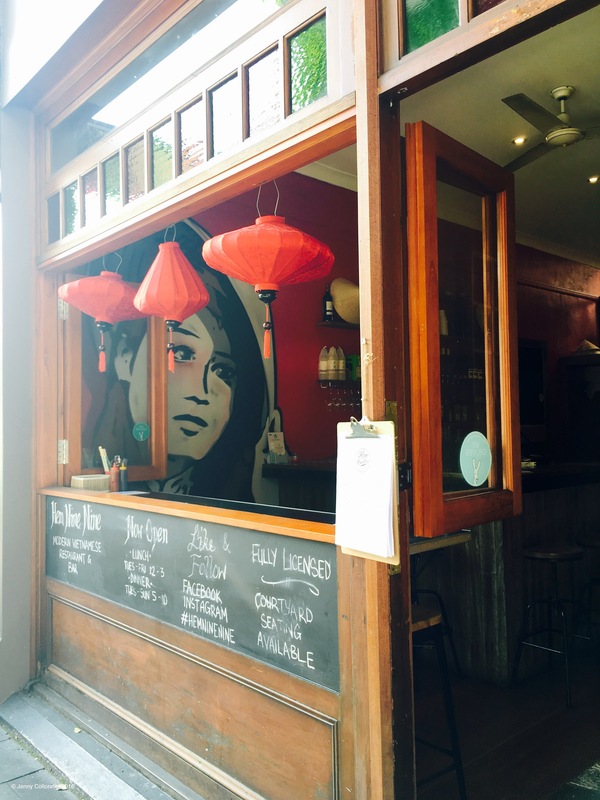 How about Yum Cha with a crabster seafood twist? House of Crabs is very shack-like and brought me back to my days at Bubba Gump in the states … The boatlike feel of the place is an explosion of energy adorned with indoor umbrellas, coloured light-bulbs, upside down boat & skis plus much more mayhem (in a crazy good kinda way) … There would never be a dull moment when it comes to decor, food or vibe in that place! 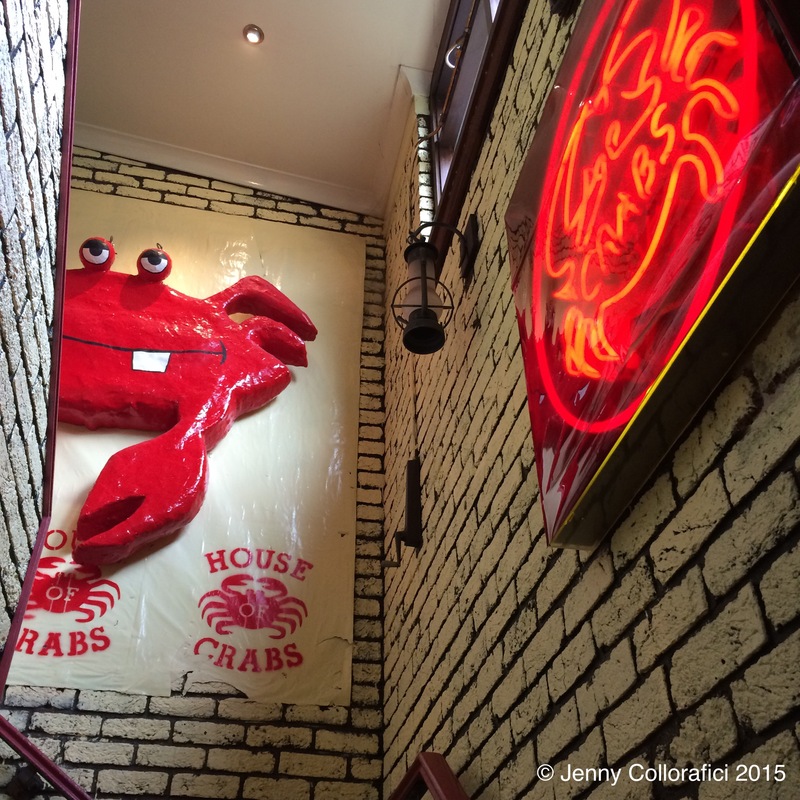 House of Crabs is located in the Sydney suburb of Surry Hills – on top of the Norfolk Hotel, Cleveland Street. 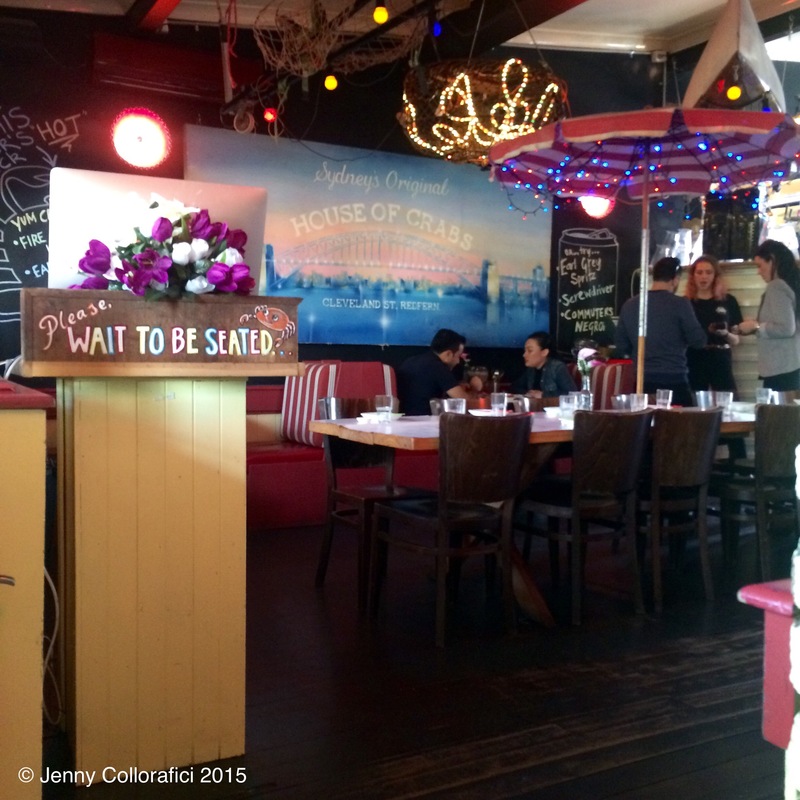 To state the obvious, they specialise in Crabs and seafood in general … In this case, I am going to talk about the monthly ritual of “Yum Cha” at the House of Crabs and their take on this tasty treat! 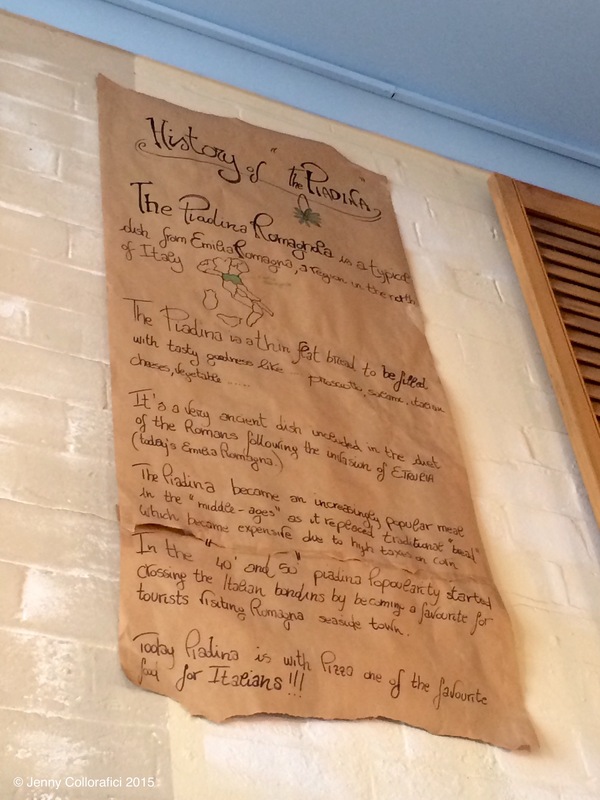 The regular menu can also be available but please listen to my Yum Cha plea! 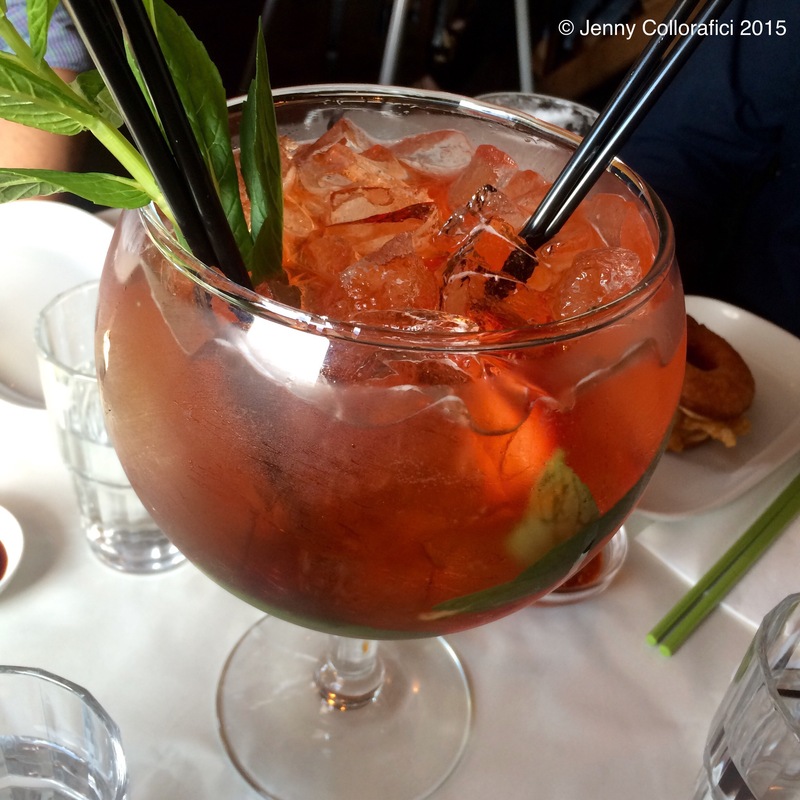 So without further ado, let me take you on my Yum Cha journey … Beverage-wise we went down the alcoholic route “Strawberry Pimms Fishbowl” (Pimms, Gin, Strawberries, Strawberry Liquor and Mint) – it’s massive and full of deliciousness … To share of course so grab a straw and drink away! 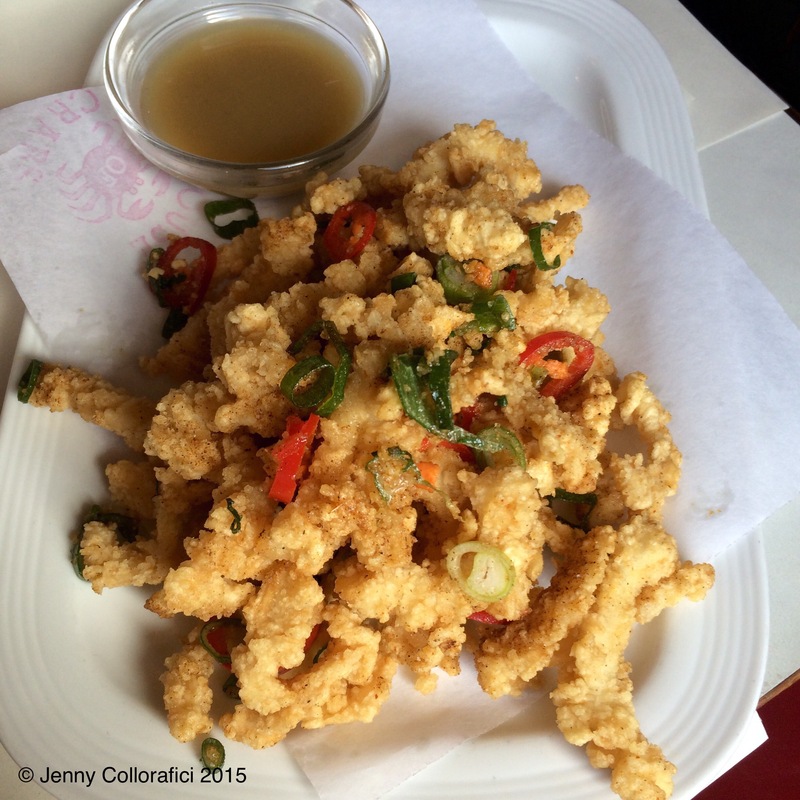 Selecting from the Yum Cha card was tricky – every inch of my being wanted to select pretty much everything! 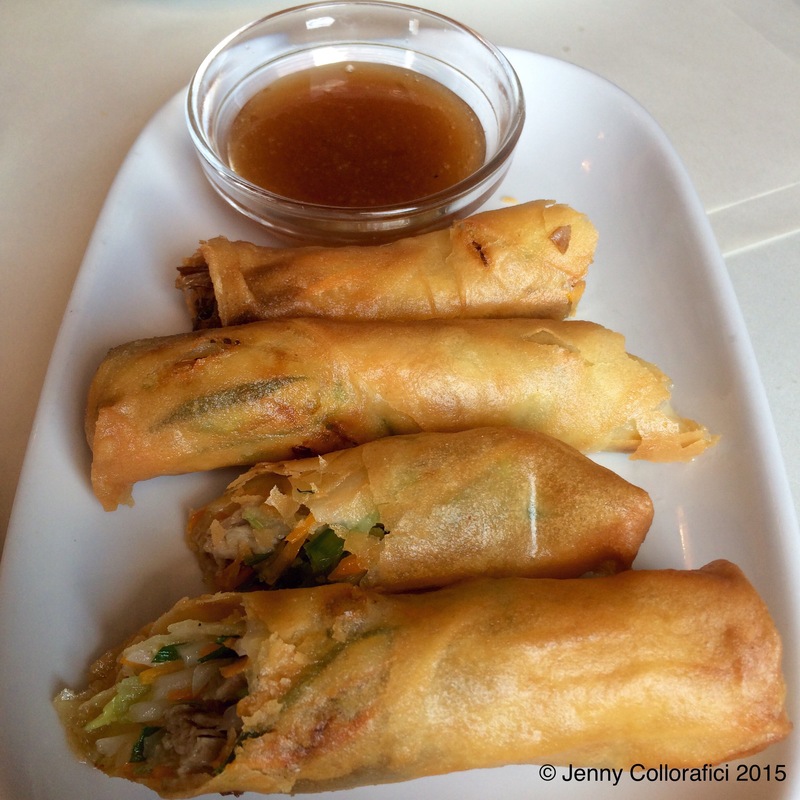 We started off with the Duck Spring Rolls with smoked plum sauce. This was a perfectly superb way to start a Yum Cha feast – the tender duck is tastily mixed with subtle-yet-present veggies (also adding a rainbow of colours), cooked and encased in golden fried spring roll wrapper … The smokiness plum sauce paired well leaving me wanting more! Everyone knows that smoke and duck just dance together with a spring in the spring roll step! Next on the list is the MUCH HYPED Lobster Donut – now yes it’s small but hear me out … The cliched saying is “Good things come in small packages” … Small or not, this is a little pocket rocket of a dish that explodes tastebuds! 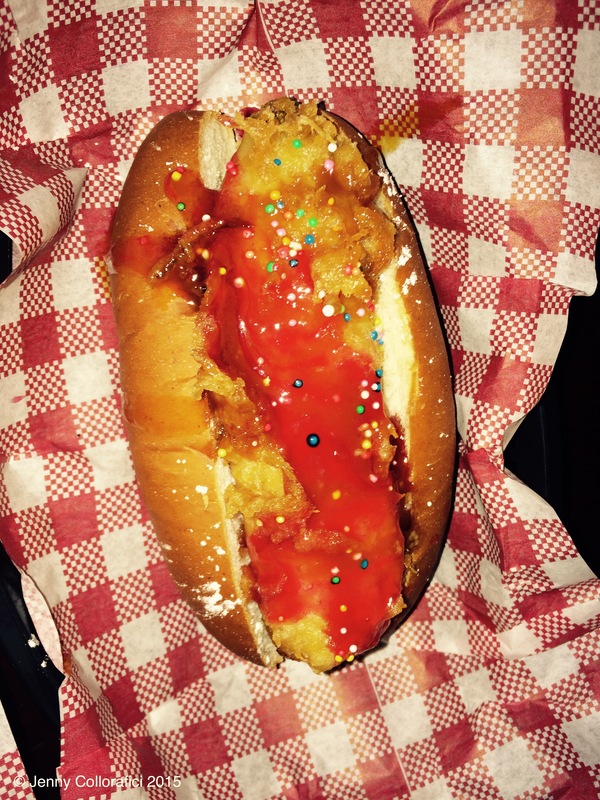 It’s oily (just the right amount), it’s decadent – the donut is hot, freshly fried with a slight crunch of the donut coating – whilst leaving the inside soft and donut doughy … The lobster itself is cooked as salt n pepper batter and dolloped with XO Mayo – it’s an inventive Asian Fusion Dream! 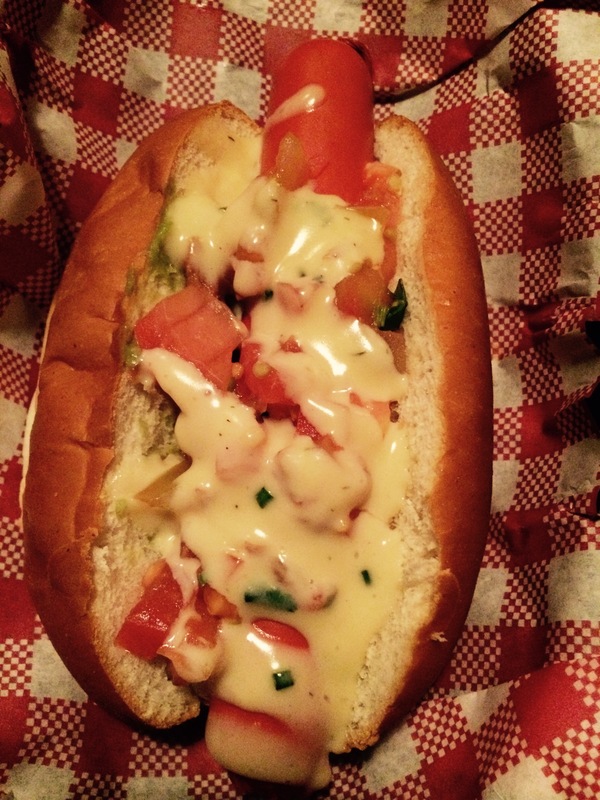 … Note that this is also available on the regular menu but keep an eye out on the Facebook page. Still keeping in the salt n pepper theme the next dish that graced our presence was Popcorn Salt n Pepper Squid with lime. Now I have to admit that at times, squid has been too rubbery and chewy – almost unpleasant to eat – but this contradicts all of my fears and supersedes this on all levels. The dish is light (yet had a crunch), airy, with bursts of heat (if you get a chilli) & some tang once you dip in the refreshing lime juice. 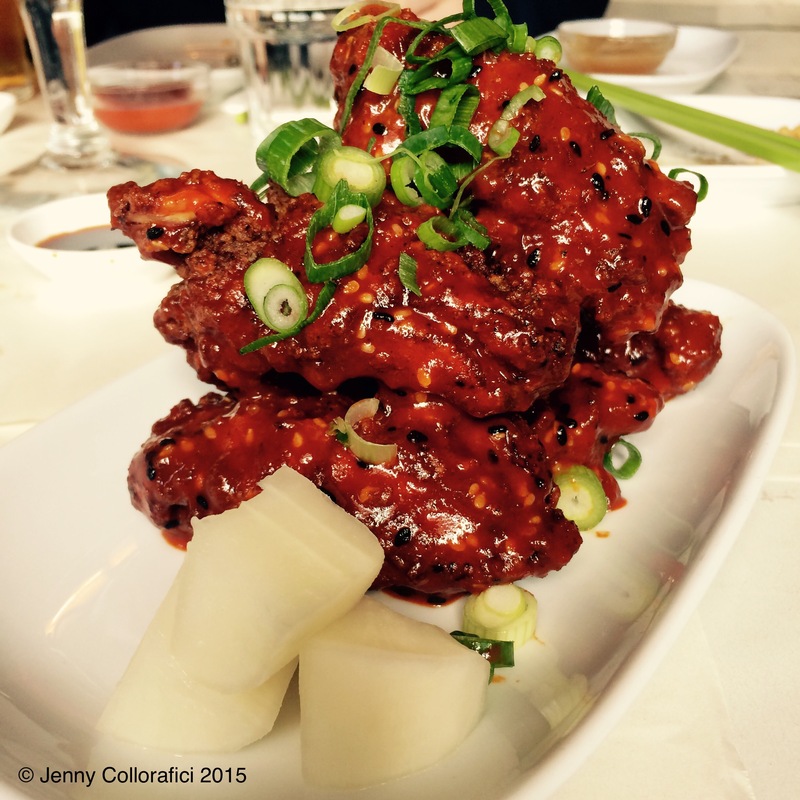 Bring on the next tasty treat: Spicy Korean Chicken Ribs and Daikon … Tasty – yes! Spicy – heck yeah! One of my pet peeves is that there is not enough sauce or marinade – be generous people! There is absolutely zero point in eating any sort of ribs if you don’t get down and dirty … The sauce was sticky, with a speckle of sweet and a whole lot of hot chilli spice! Daikon is a white radish – it’s not for everyone but it was the balance of fresh element neutralising the heat! Last but not least, pork belly – let’s face it, when you go to Yum Cha it comprises of all seafood and/or all pork errrrthang! Sticky Red Braised Pork Belly … Adoned in it’s glory glossiness you can see that it’s going to be a melt-in-your-mouth-situation … The juicy and fattiness of pork belly cannot be denied in this dish. Crowd pleaser – that is all. I’m sure to my readers disappointment I didn’t have any crabs haha but I will return (I have tried them before) so this time as we had already ordered so much, we selected the MEATY QLD Prawns with the lemon pepper sauce. Any crustacean is boiled and served in a bag (drowned in your chosen sauce/marinade) then tipped on the paper cover table … No cutlery required. 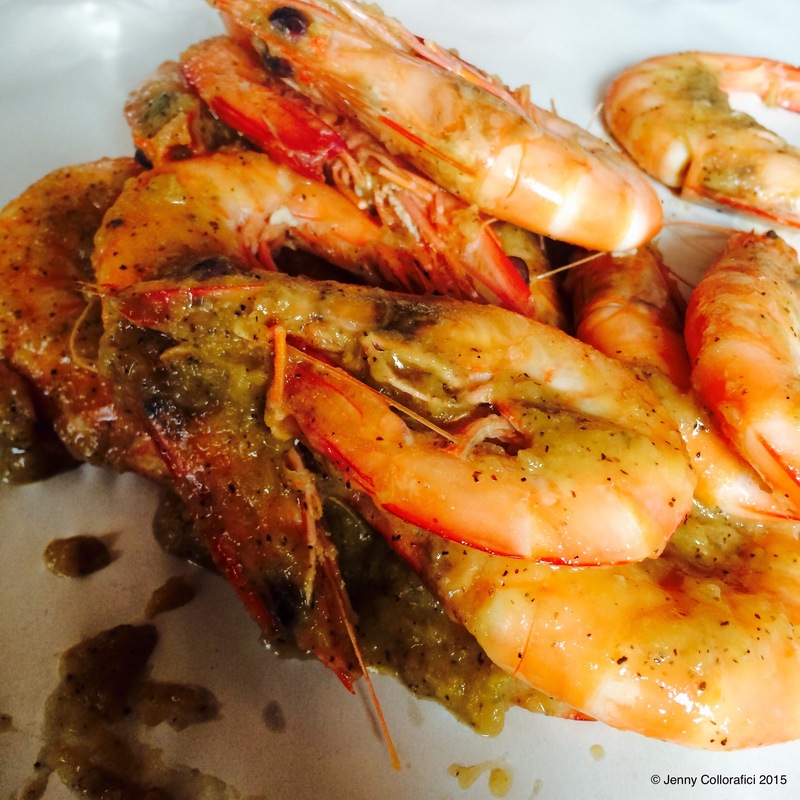 The sauce is so succulent with the prawns that you are slurping and sucking all the prawn shells dry! It is with regret that I was TOO FULL for dessert or anything sweet (I know – WHO AM I?!) … This doesn’t happen very often I swear! For me there were actually not enough dessert options to entice me but there may be a chance that the times have changed … I should def check it out – but that being said I want to make it clear that I was very full and very satisfied. House of Crabs Monthly YUM CHA event takes place on the 1st Sunday of each month and bookings are encouraged … But the sad news is that it’s done for the year *CRIES*- the last 2015 Yum Cha sitting was a few weeks go but please don’t despair, follow them on Facebook to keep updated for 2016! I promise you will not be disappointed … But either way check them out and keep your eyes peeled on my return to this Sydney joint! 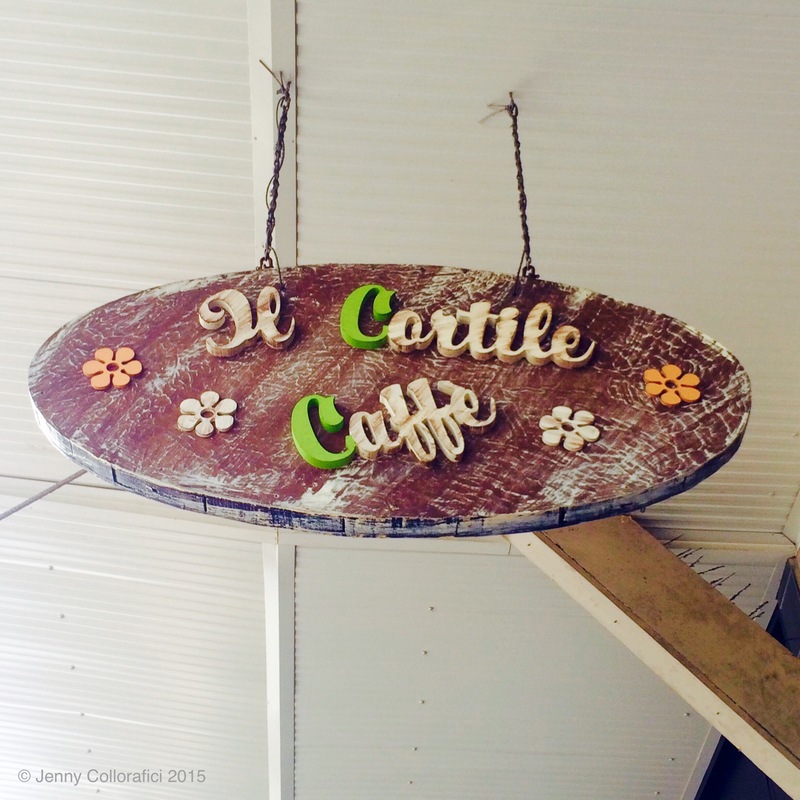 Thanks for checking in readers and I promise you … More Italian, Spanish and Shoe delights coming you way … PLUS the latest on my baking escapades. 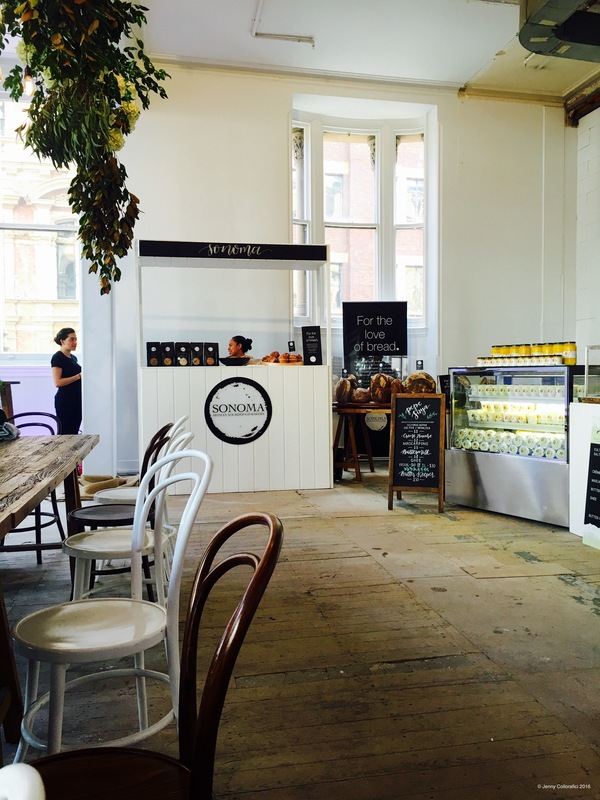 Sydney Foodies near and afar … I Heart Hartsyard’s Hearty Food! How I see it is that sometimes you need some hearty food to heal the soul and fill the hunger. 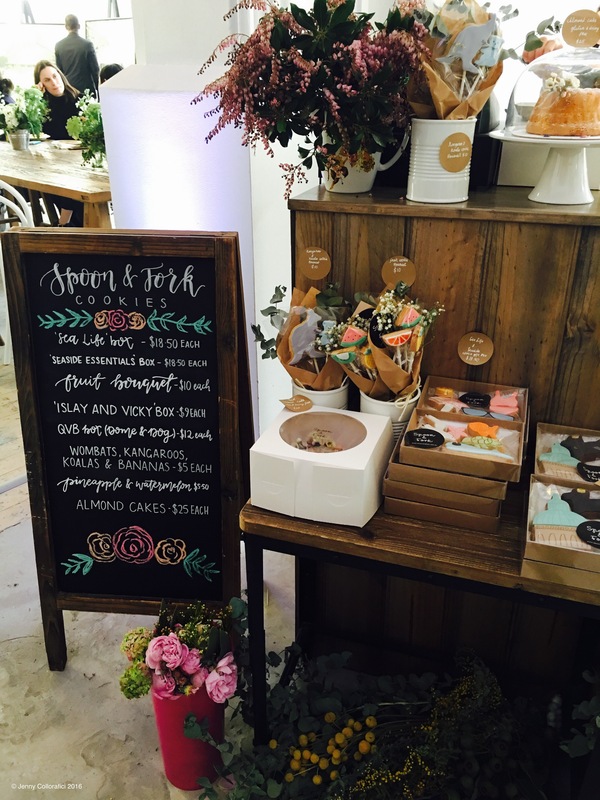 Hartsyard is a cozy, mood-lighting joint created by a husband/wife New York duo … They have brought comfort cooking to a new level – with their seasonal fresh produce & inspirational flair. 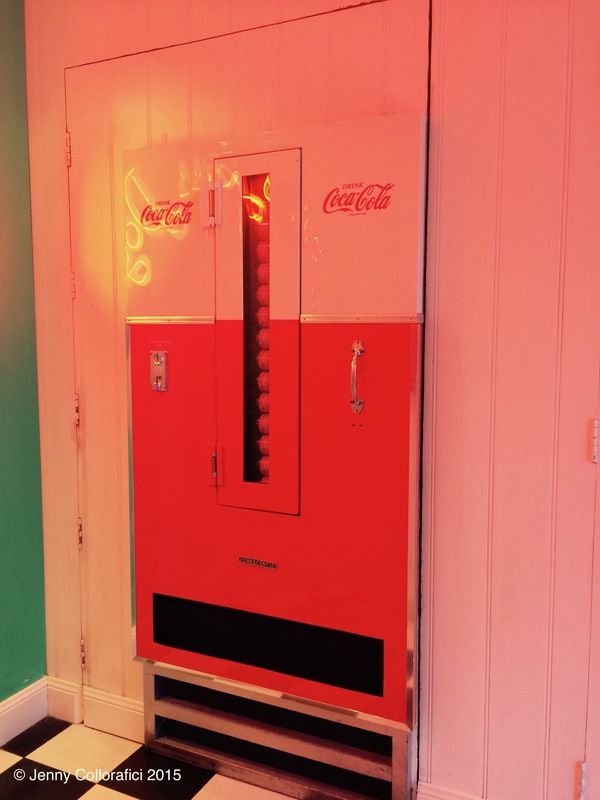 It’s American Diner meets Soul Food Classiness … Located in the heart of Newtown (Sydney) there is nothing better than a cozy & cool night out! It was on a Wintery Saturday Night (this is a post WordPress Post – remember I have lots to update you on!) – freezing cold according to Sydney standards … Dressed with about 3 jacket layers I was ready for my Saturday date night. 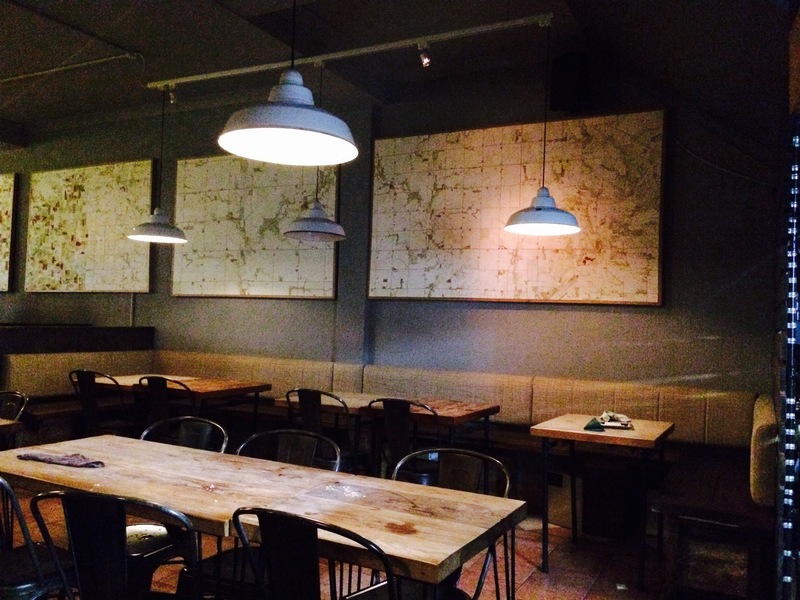 Seated we were ready to order – the philosophy of Hartsyard is that food should be shared among good company. Items on the menu may look “few” but this is due to the high quality – you can see that each dish has been carefully chosen with care, on purpose and with meaning. No part of any animal or vegetable is wasted in the cooking process from curly pig tails to celery leaves. In addition to this, there are some unique specials on board. 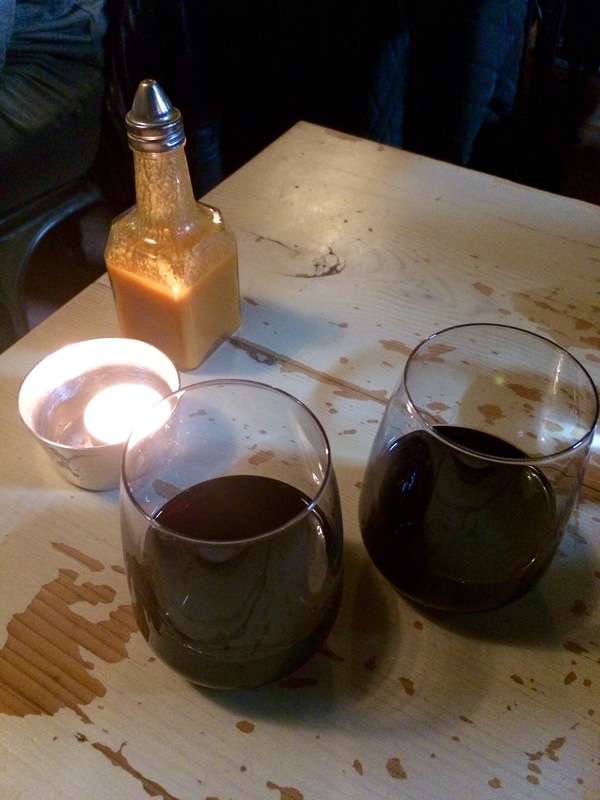 Perusing the menu, we selected to sip on an Italian Red Wine – Nero D’Avola … A traditional Sicilian wine, it’s known properties include having some body (without being too heavy) and a hint of sweetness to create a complete wine with versatility! 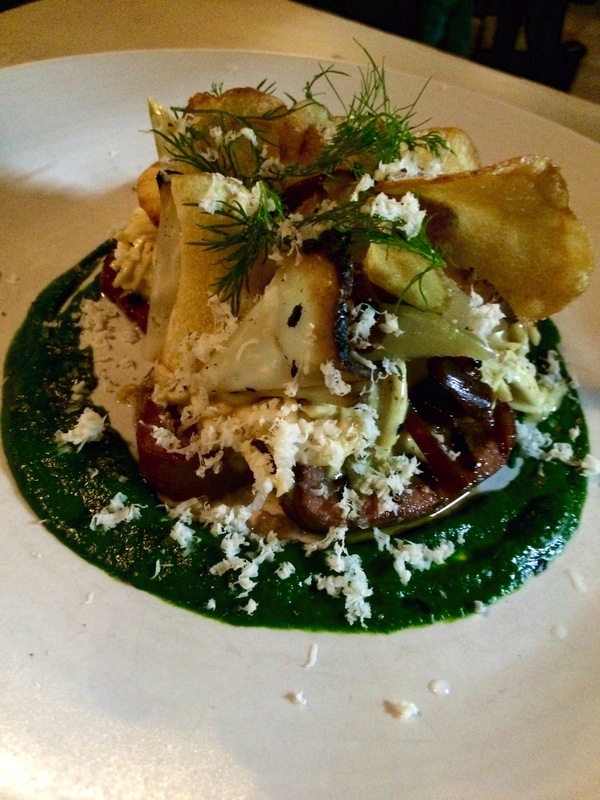 “Seed” is equal to an entree … We decided to try the special of the night: Grilled Veal tongue, roasted celeriac, parsley purée, celeriac remoulade, horseradish & crisp potato. One would think that such a dish would be so complex & overcomplicated due to the various elements – but there is such a unison of flavours … You have the juiciness & melt-in-your-mouth veal tongue on a parsley puree, to the freshness of the parsley purée & fresh topped herbs and loved the crispy crunch of the potato-type-chip. 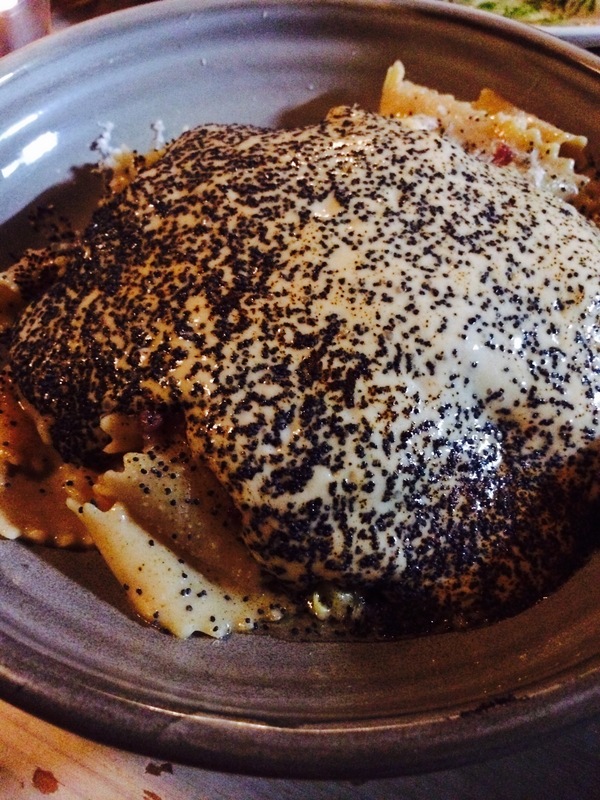 “Feed/Main” – First Round of the mains, we shared Papardelle with guanciale (pork neck), mushrooms, with marsala (sweet sicilian wine) sauce topped with poppyseeds. This was a delightful dish, very tasty and simple – the pasta was freshly made and light, marry this with the richness of the sauce infused by the various elements. 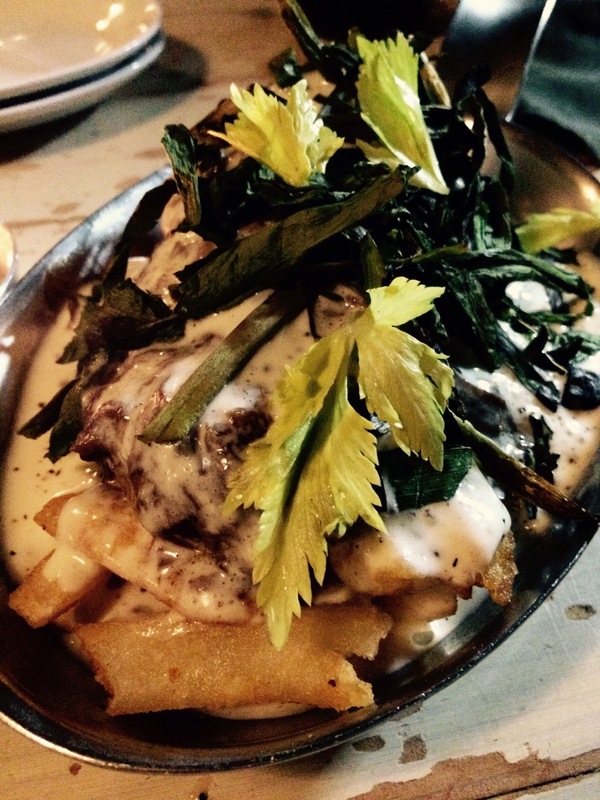 “Feed/Main” – Second Main to share was the Poutine: fried potatoes (chips) braised beef shin, beer & cheese sauce. Now hello potatoes – they remind me of fat chips – now what’s one step better with that?! 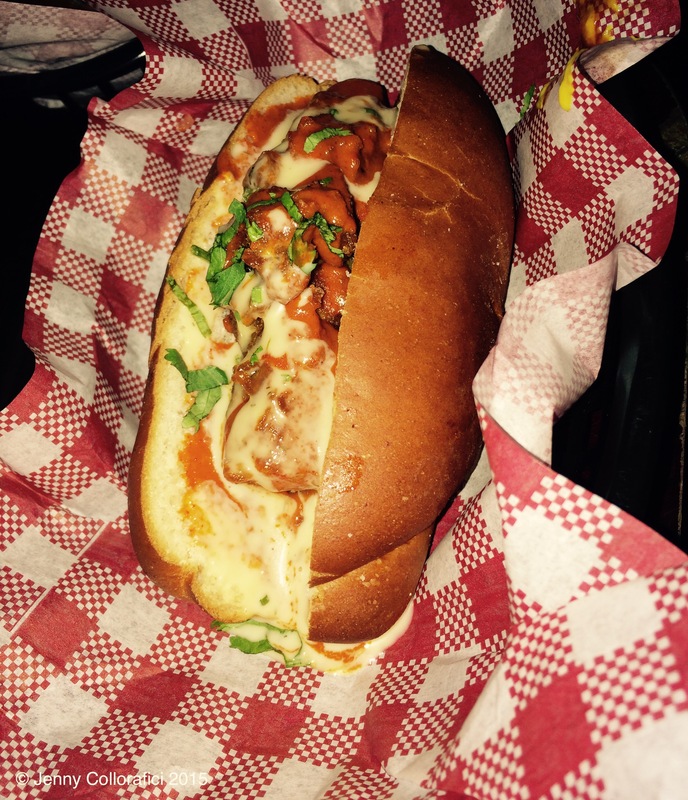 Adding melted cheese, beef falling apart & melting in your mouth like – spot the familiar theme?! Hehe … Topped with celery-type leaves for freshness – this oozes decadence … Marry the flavours of the potato crunch to the cheesy meat melting party … all rich of flavours dancing with your tastebuds. 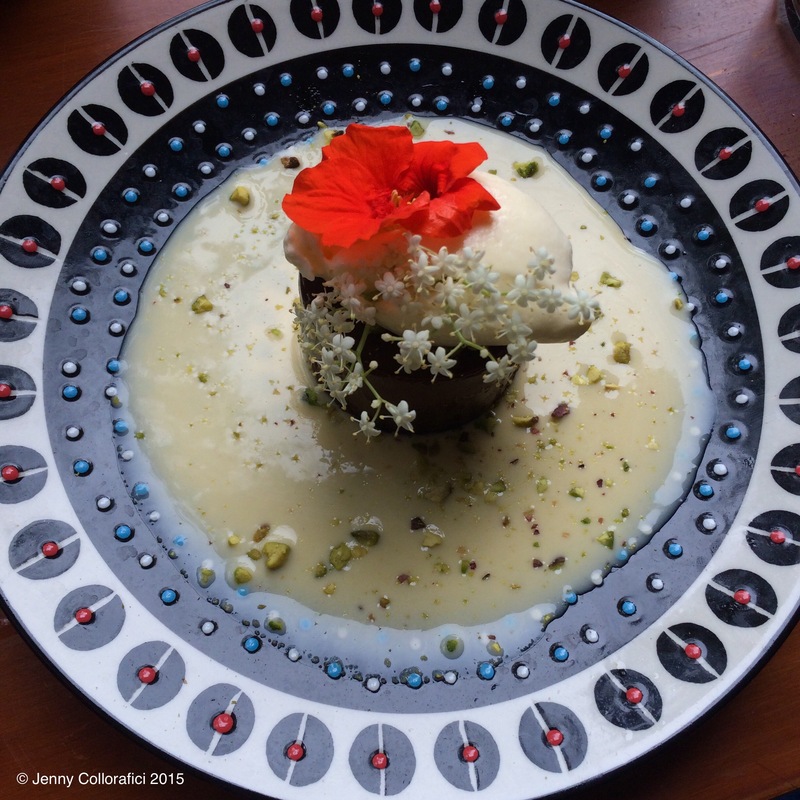 Dessert – come on readers, you know that I can’t go without it! So we had the “special” of the evening (hopefully all my dessert detailing haven’t been forgotten from the distant memory!) 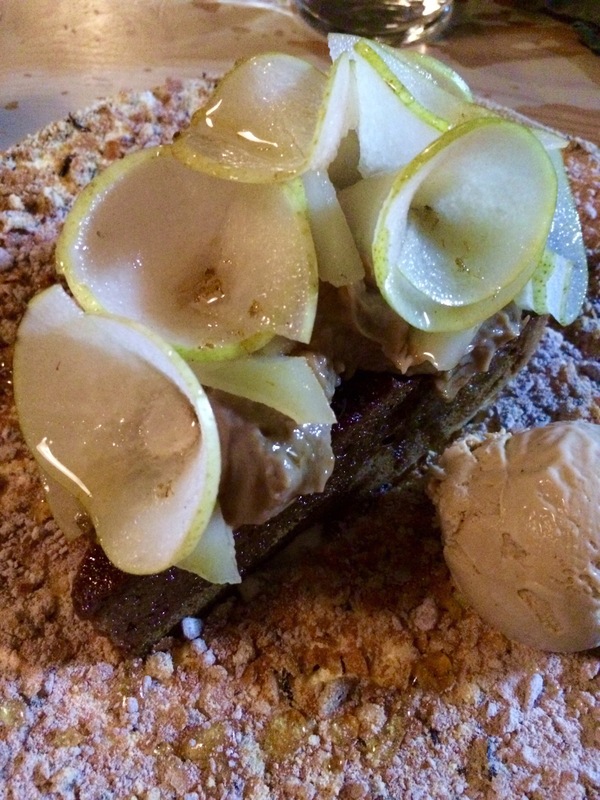 … Ginger spiced cake/pie with apples & a chai-latte-tasting ice-cream & cream surrounded by crunchy crumbs. This was truly HEARTY! To be clear, this must be shared and not for the faint hearted – Hartsyard’s desserts are a big feast just as much for the eyes! This dish was like if a pie, pudding-type-cake and chai latte all had a party! The apples apples added a light freshness to the rich dish. 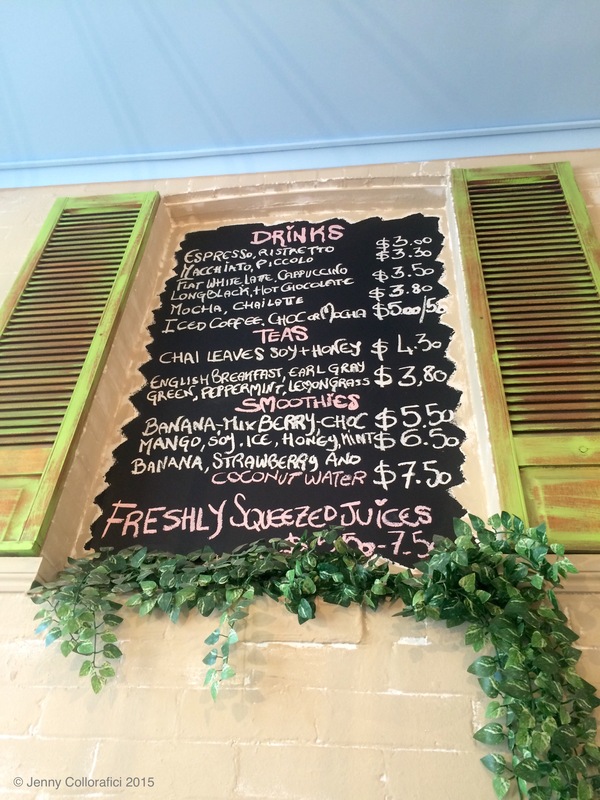 Word through the grapevine is that they have done a bit of a revamp with the decor so I better drop by again and check out the menu too! Now readers, I’m excited to be back on board and I promise I will up the posts to keep you mouths watering and wallets empty from shoe or shopping purchases!